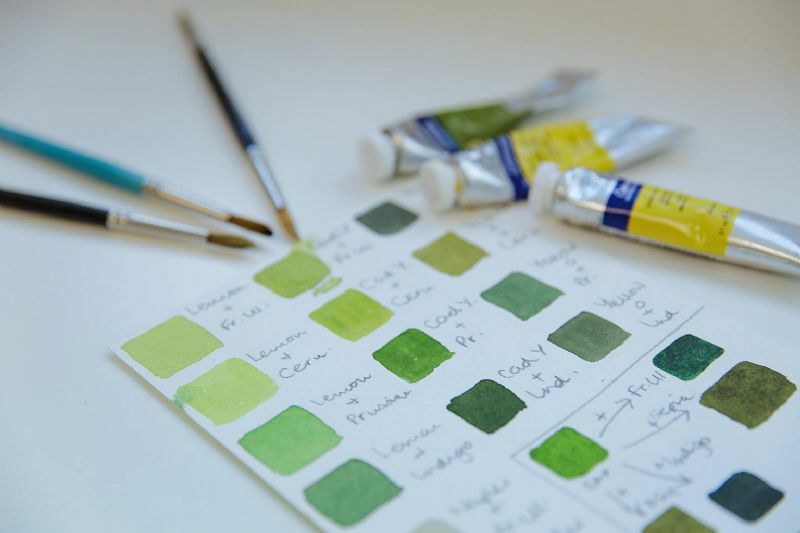 A two day intensive course focusing on working with oil paints. 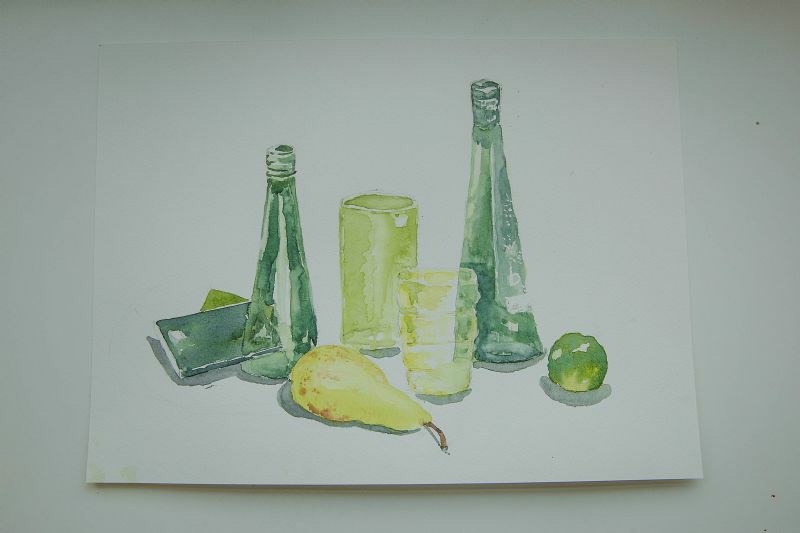 Suitable for all levels, you will be tutored by acclaimed local artist, Sam Wadsworth. 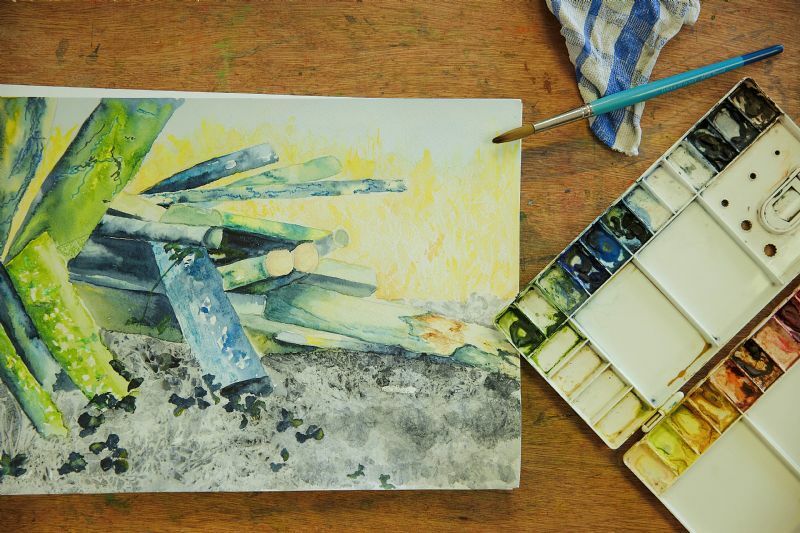 A five week course that will introduce you to this exciting medium in which you will get to know the materials and learn basic watercolour techniques. Each week you will learn a new technique and use it to create a finished picture. All materials are provided. We have a great Beginners Watercolour Painting Kit in our shop. Click here to have a look! This course is ideal if you've painted in the past and you fancy picking it up again. Aimed at those with some experience of watercolour painting, or who have completed our Beginners course. We will revise key techniques, learn how to simplify a subject and work on form, tone and colour. This class is currently full. Please contact us if you would like to join our waiting list for a space. A great opportunity to improve on your drawing skills and try out working with pencil, charcoal and coloured pencils. Have a go at still life, portraits and landscapes and learn more about shading, sketching and perspective. The course is suitable for beginners, and those who have done it before, but would like a little more practice. Many different subjects are covered, so if you have attended this course before you are welcome to come again, just let us know when you book. A wonderful introduction to the medium of pastels - develop your drawing skills and master the techniques of working with pastels and their beautiful range of colours. This is a four week course and all materials are provided. 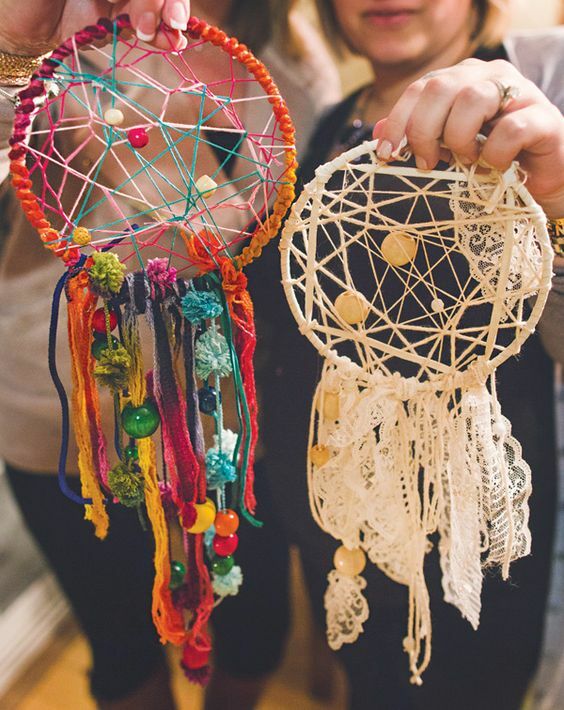 Raid our stash of crafting goodies and design and make your own dream catcher…a twist on the classic! Adding beads and ribbons for the finishing touch. Join us for 4 sessions of learning and exploring, ideal for creative 7-11yr olds. 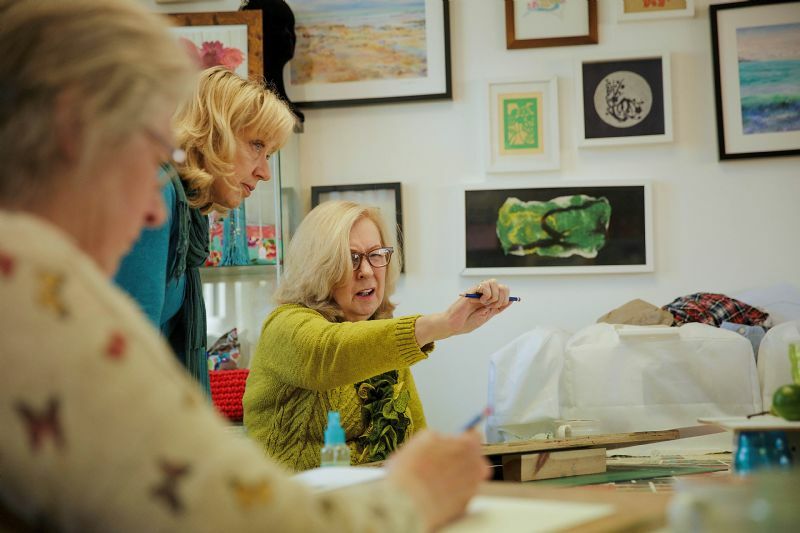 We explore different mediums, subjects, artists and ideas each week in these fun sessions with artist and tutor Meg. 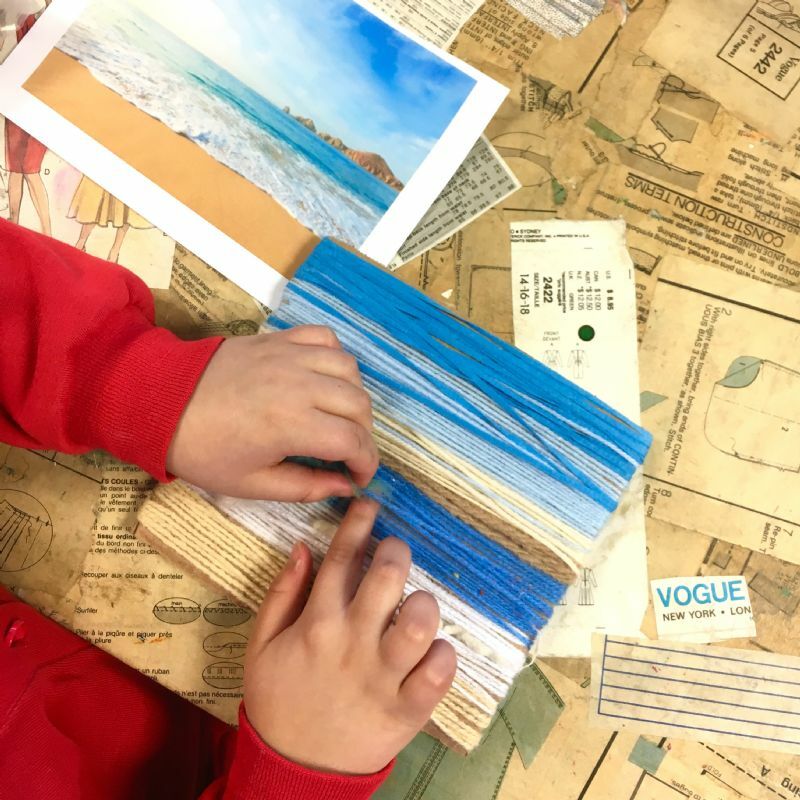 Past activities have included observational drawing, making cardboard sculptures, learning watercolour techniques and working with clay! All materials, guidance and inspiration included, as well as a drink and a biscuit! £40 for all four sessions. 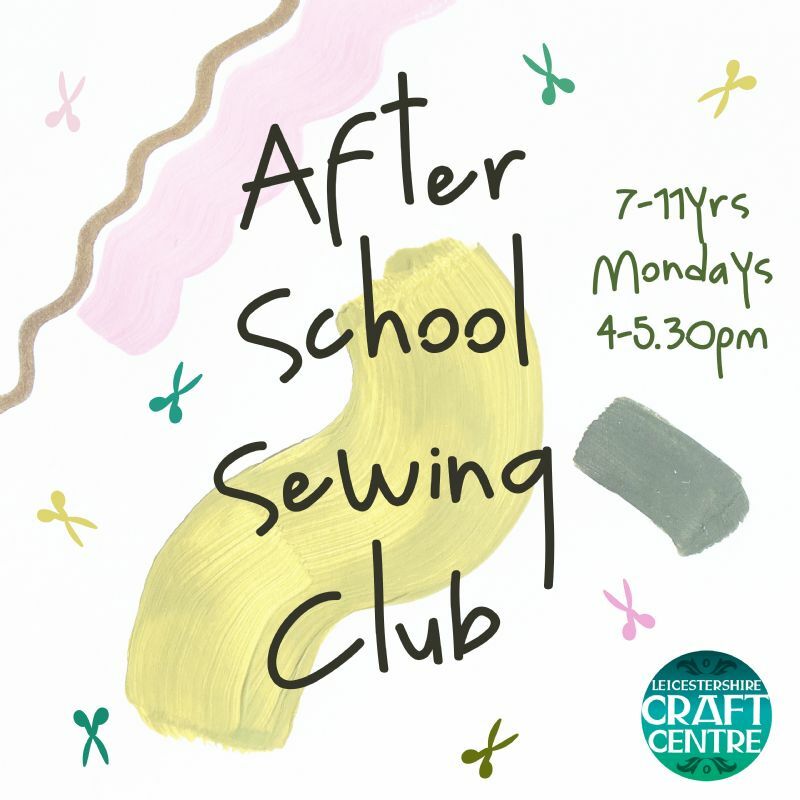 As an expansion of our ever-popular sewing clubs on Saturdays, we are pleased to offer a weekly after-school sewing club! Running in blocks of 4 sessions, we will teach the children how to use a sewing machine and work with fabric. We find that children are delighted with what they can achieve and the lovely projects they make. 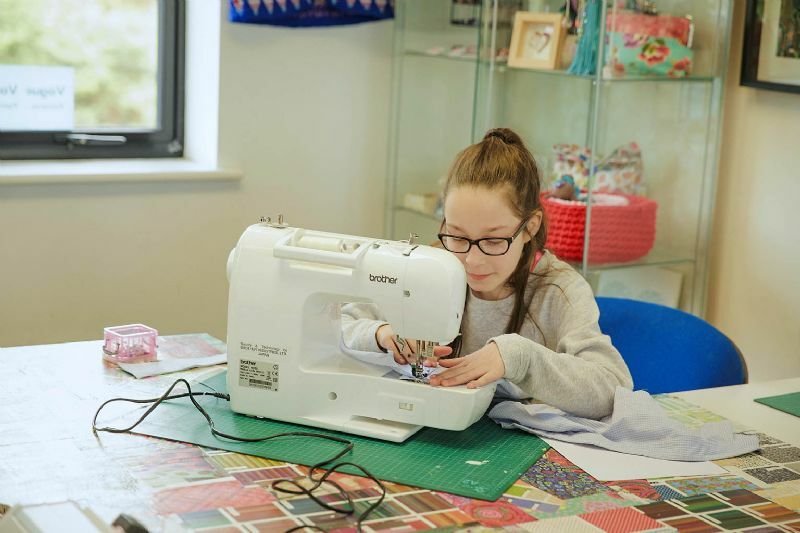 This course is suitable for 7-11 year olds and we can cater for all ability levels, including those who have had no experience of sewing machines. They will learn all about the sewing process whilst having fun making different projects. Come and have fun modelling with clay and building your own sculpture! 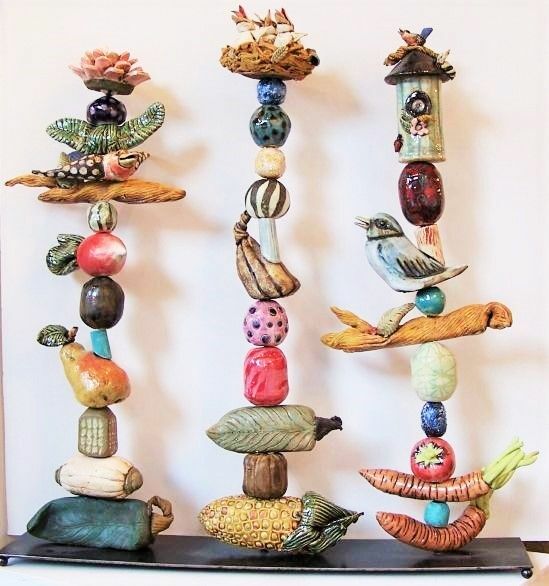 Design and make a different shapes to create a totum pole design - we'll be using air drying clay, so you'll be able to take them home the same day to paint when they're dry! Suitable for age 7+. Materials and snack included. 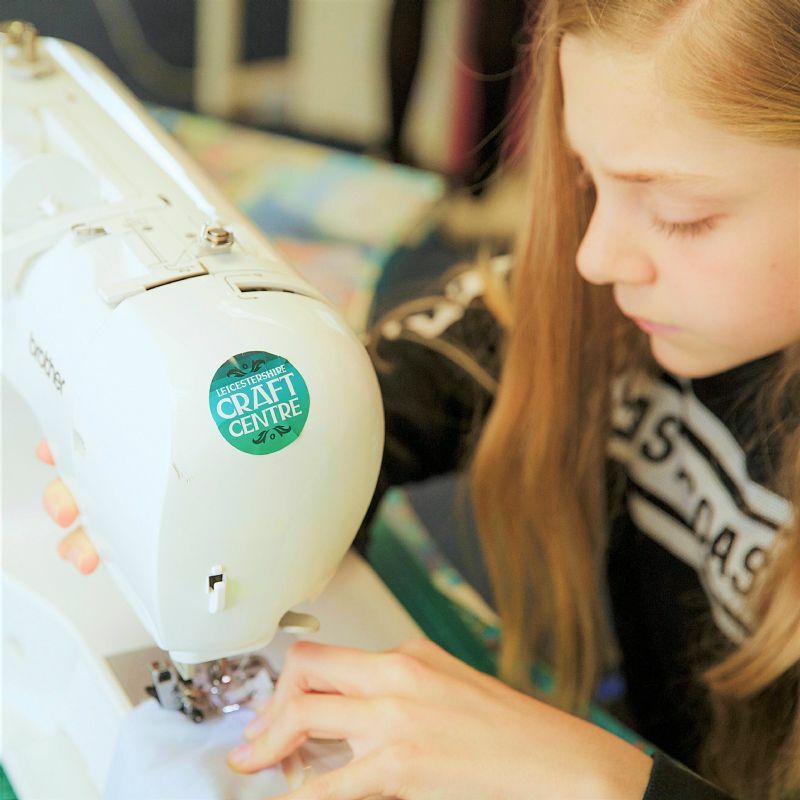 A sewing workshop for those aged 10+. You will learn the basics of how to use a dressmaking pattern, cut out your pattern pieces and sew them together using our wonderful Brother sewing machines. You will leave with a wearable garment made to fit you perfectly! Patterns will be provided for this course, but you are required to bring your own choice of fabric. You will be told in advance what type and quantity of fabric you will need. You will also need a packed lunch (no nuts please). Do you have a child that loves art? Then these one-off workshops are for them! 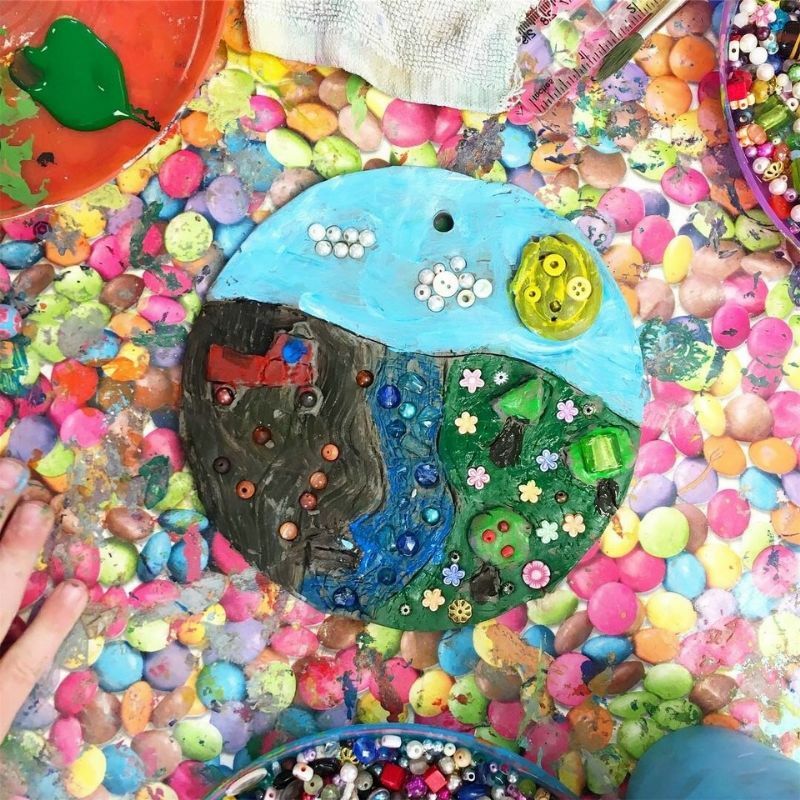 Led by artist and tutor Meg, your youngsters will experiment with mediums, explore new techniques and discover exciting artists! With different activities for each workshop, expect drawing, painting, sculpture and more. These workshops are also a great taster of our After School Art Club! 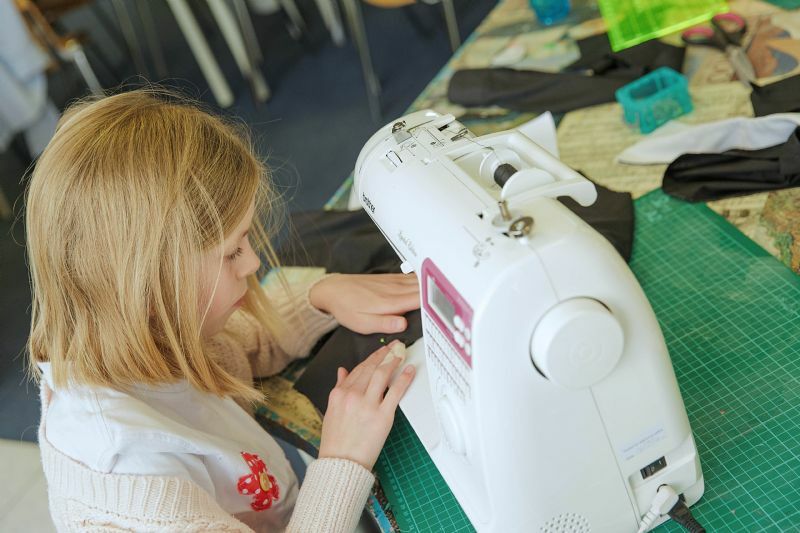 Aimed at beginner sewers aged 7-11, we undertake lots of different projects building up cutting and sewing skills along the way. Projects can include, soft toys, patchwork, applique and simple dressmaking. Our popular sewing club for older children who have already had some experience working with fabric, cutting and sewing. We will tackle more challenging projects and fabrics to build on existing skills and learn new ones including inserting zips, learning to read a pattern and creative techniques. Previous projects have included a piped messenger bag, onesie, jersey top and patchwork quilt runner. If you are unsure whether your child has sufficient experience to join this class, please call and have a chat with Katharine or Hannah. Depending on the project we undertake, you may need to purchase extra fabric for this class. If so, we will email you details of what is required. A fantastic course for older children and teenagers. Learn to saw, file and drill precious metal and create your own pendants to take home. Working with aluminium (looks like silver, but easier to work with for beginners), you'll design your own simple shapes and follow the process through to a completed piece of jewellery. Please Note: For insurance purposes, this course is only suitable for children aged 10 and over. This course is booked directly with the course tutors. You will be re-directed to their website for booking when you choose a date below. Children love the therapeutic nature of weaving and its beautiful results. In this session they will create a small wall hanging designed by themselves! Suitable for ages 7 and up. 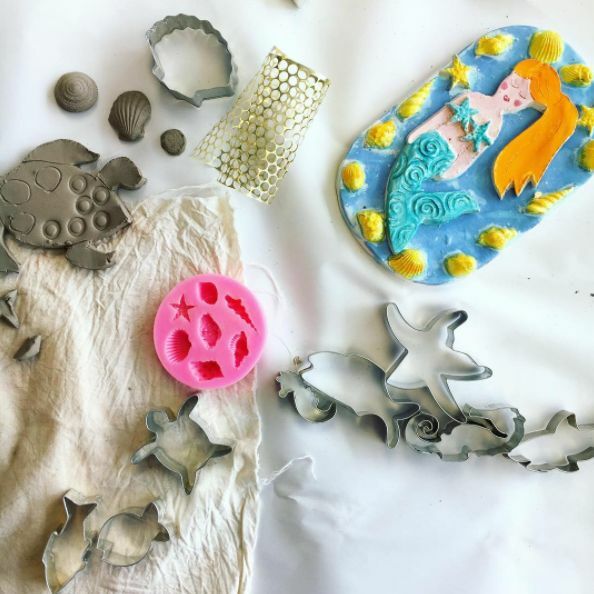 Have fun with air drying clay to design and create a landscape of your choice that you can take home the same day! Suitable for 6+, materials and snacks included. A session suitable for children aged 7 and over. 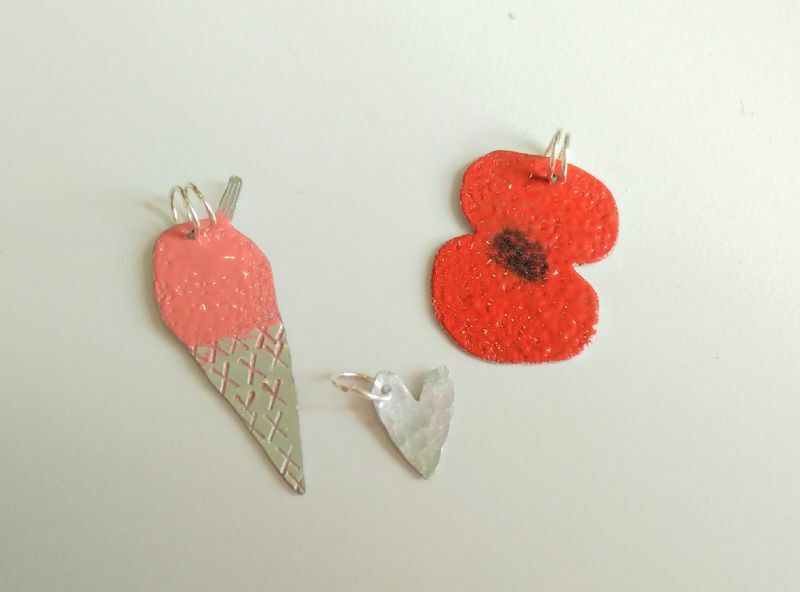 Come and make your own jewellery experimenting with enamel powders and the cold enamelling technique. This works really well as a follow-on course from the Children's Silversmithing, where you can decorate the shapes you have cut out. This course needs to be booked directly with the Course Providers - please CLICK HERE to be taken directly to their booking page. 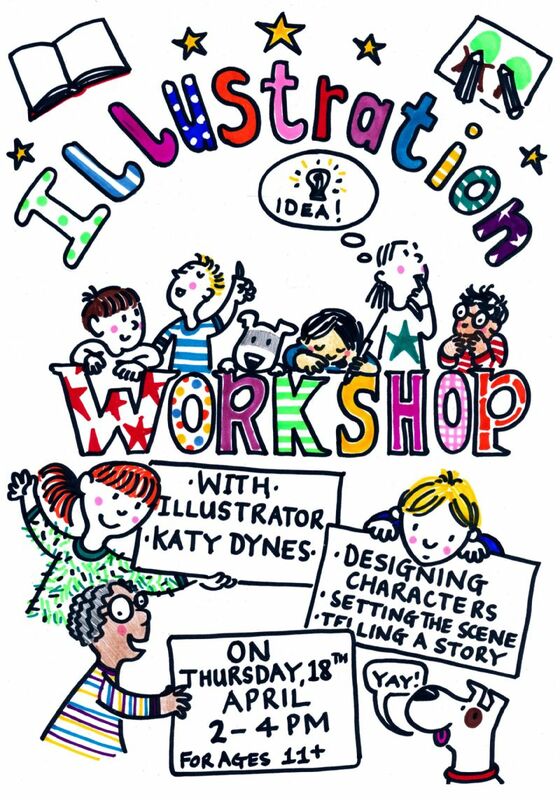 Come and learn how to make your own comic with professional book illustrator and artist Katy Dynes. You will start by creating your characters and then put them into a story. 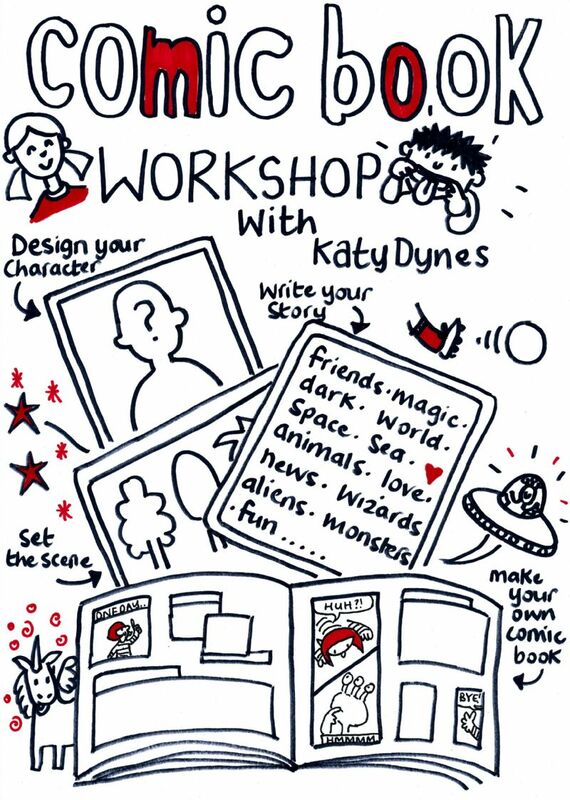 Katy will give you loads of ideas and tips on how to draw brilliantly and make your comic amazing! 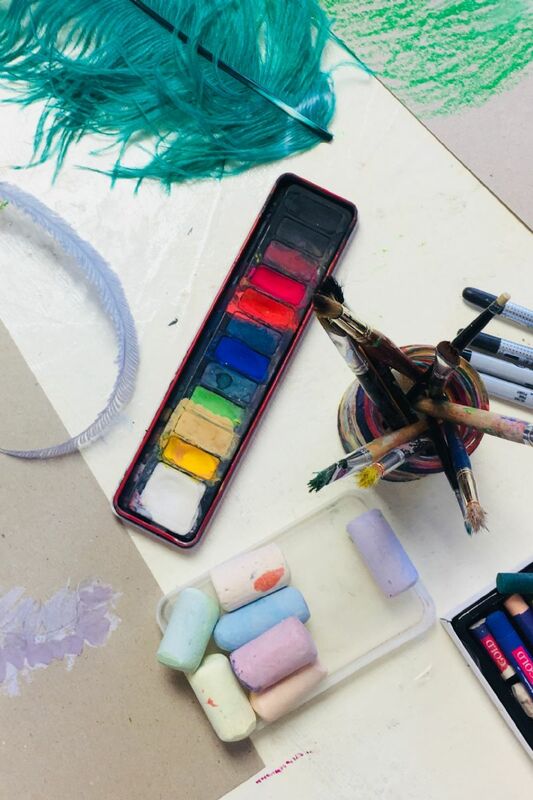 We'll have lots of craft activities to have a go at on this quick 1hr workshop - expect paper crafts, painting and more - with lots to take home! Suitable for 5+, materials included. 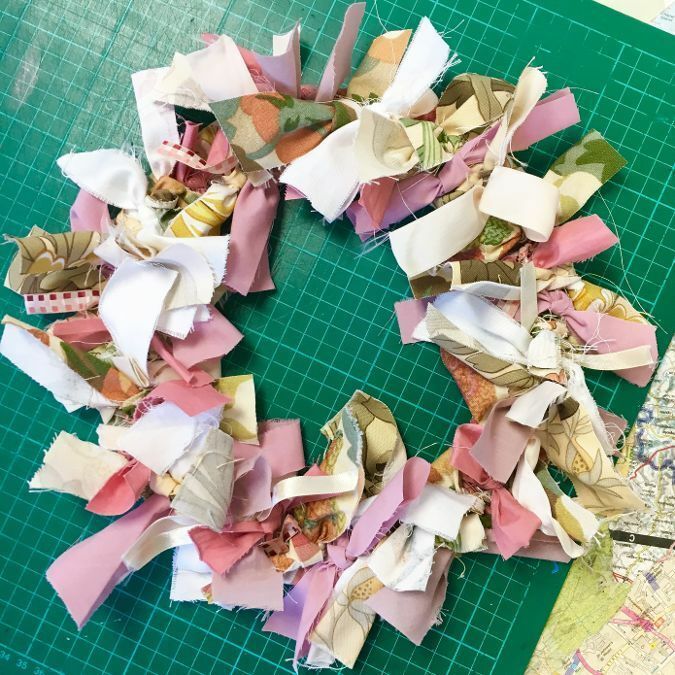 Raid our stash of fabrics, papers, buttons and other crafty bits and bobs and create your own fabulous artwork with tutor Meg. Suitable for age 6+, all materials included. 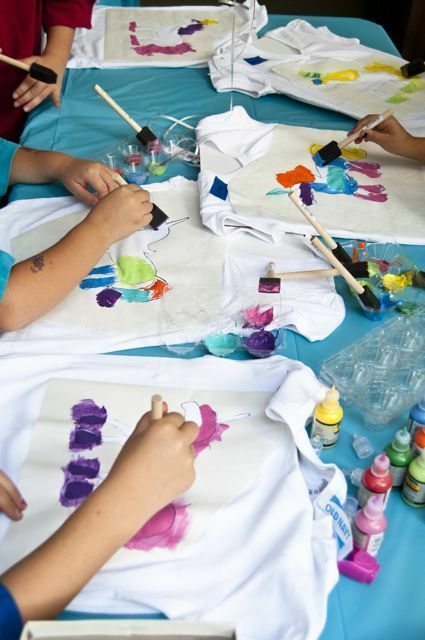 Come and design your very own t-shirt and decorate it with printing and paint! T-shirt and materials included! An hour of space-themed painting! 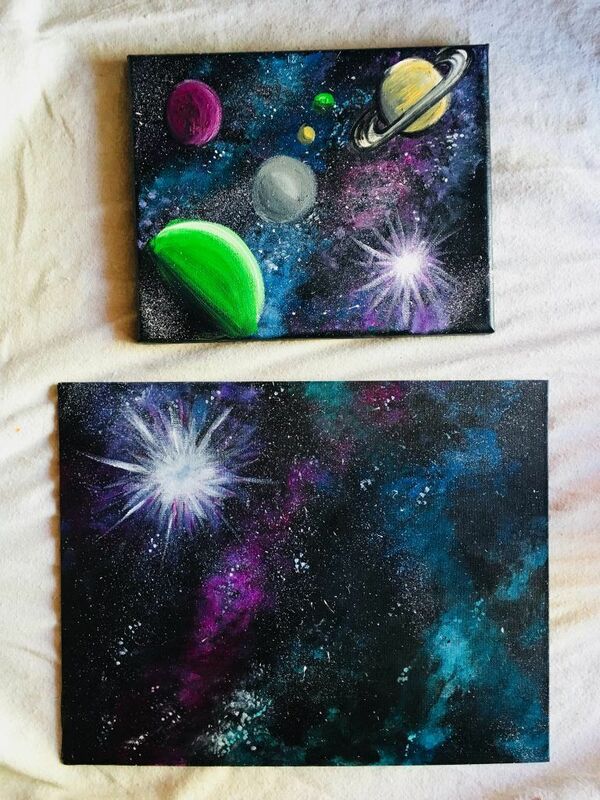 Splatter, sponge and stencil yourself starry skies and galaxies with tutor Meg! 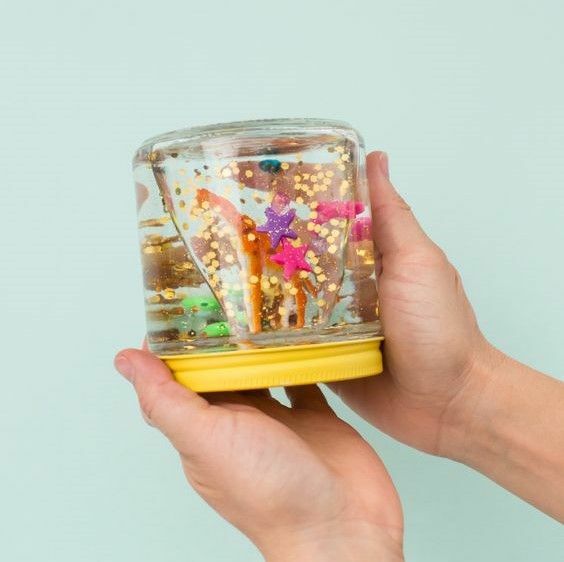 Design and decorate your own fabulous glitter jar! 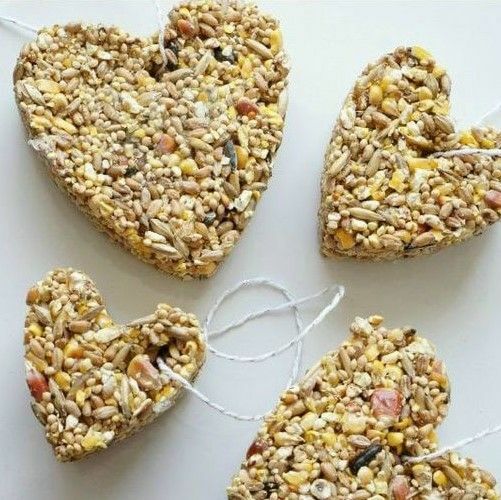 Suitable for age 6+ with all materials and a snack included. 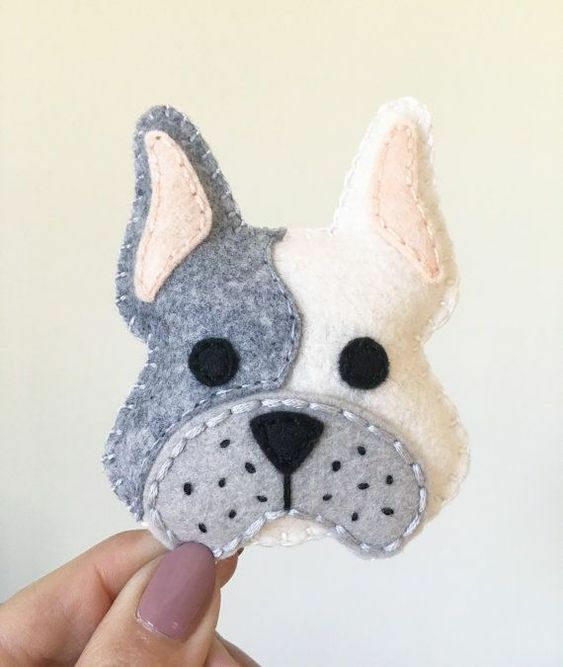 Come and make an adorable felt pet! 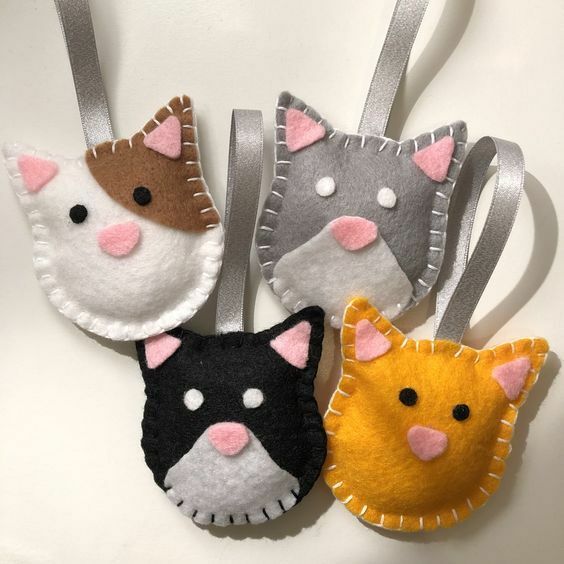 Design your own cat or a dog and hand sew it together with tutor Meg. Suitable for age 6+, materials included. 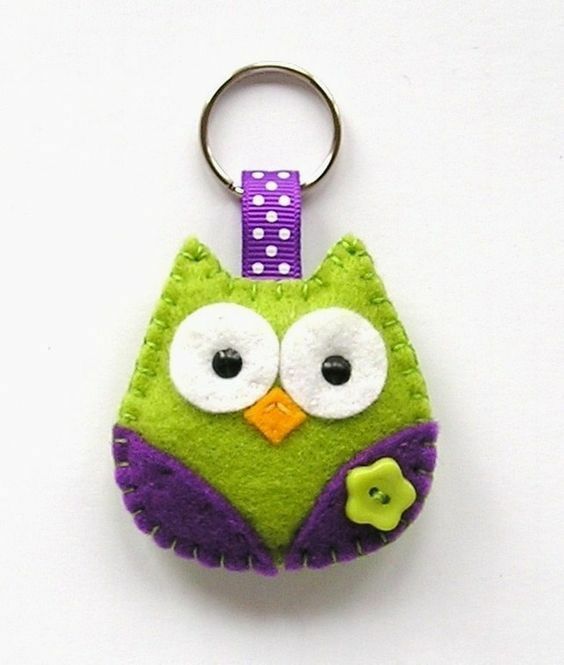 Come and create a cute keyring from felt and buttons and learn to hand sew in the process! Suitable for 7+ with all materials and a snack included. 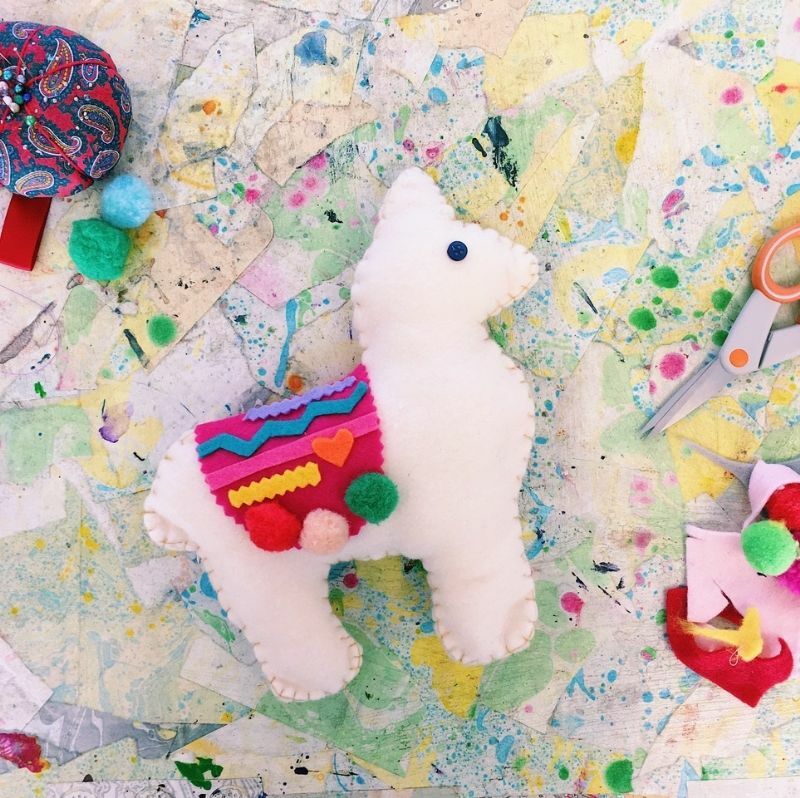 Decorate and hand-sew yourself a super cure stuffed llama! Suitable for age 7 and up, no sewing experience necessary. All materials included. 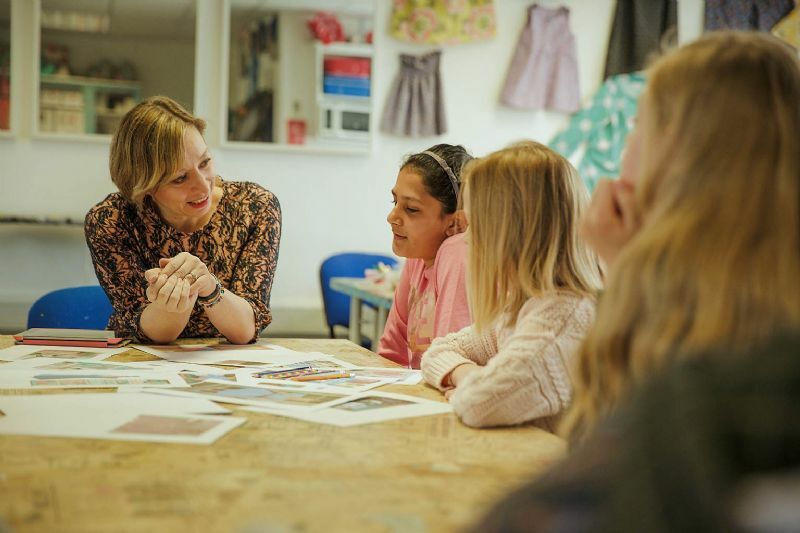 Professional book illustrator, Katy Dynes, brings her skills and talent to Leicestershire Craft Centre in a wonderful illustration workshop for Junior School aged children. We try 3 or 4 different activities each time, with lots to experiment with, make and take home! Younger and older siblings are welcome, sowhy not make it a family outing! Come and join us for a brilliant sewing workshop where we will complete a make in a single session! Suitable for Juniors (Age 7+) upwards. 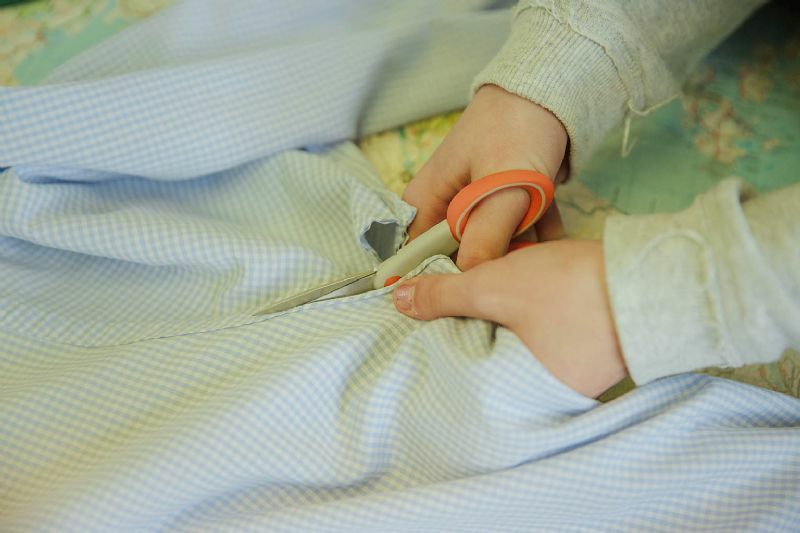 No prior sewing knowledge is required as our tutors will guide you through each stage. You will leave the workshop will a finished make and a lot of newly-gained sewing knowledge! All materials are included in the cost of this workshop. A fantastic session where you can design your very own superhero cape to wear home! Either base it on your favourite superhero character, or invent your very own! 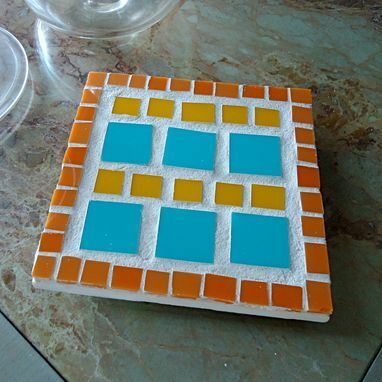 Have a go at Mosaics, using tools to design and build your own mini pieces of art from colourful stone and ceramic. The finished mosaics will be grouted by Meg after the workshop and will be ready to collect the following week. Or you can request a grouting kit to take home! 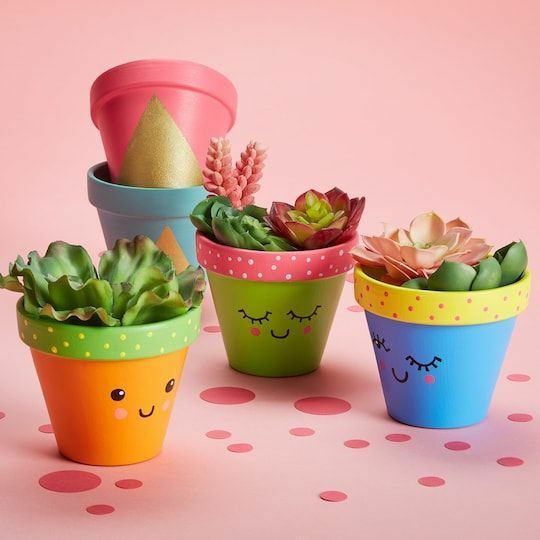 A fun painting session to make a design and make a decorative plant pots in an hour...we'll even pot the plant with you too! Make your very own kid-sized canvas bag with our fabulous block printing equipment. We have loads of designs and letters to choose from to make it personalised - perfect for school! Bring along some of your favourite photos - they could be of you and your friends, family or places you've visited - and make a scrapbook with us! 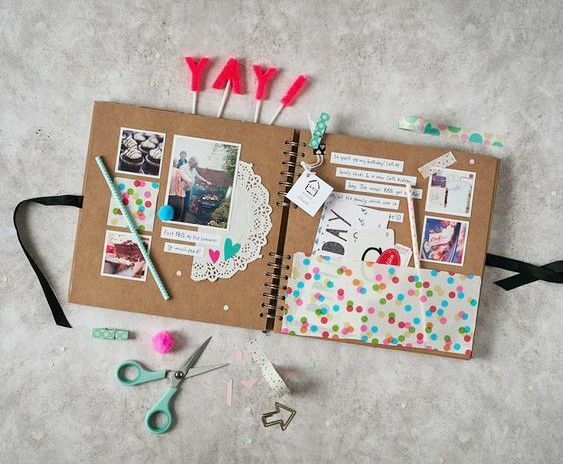 We'll provide all of the materials including the book, sequins, tapes and patterned papers and more to start your own unique scrapbook! 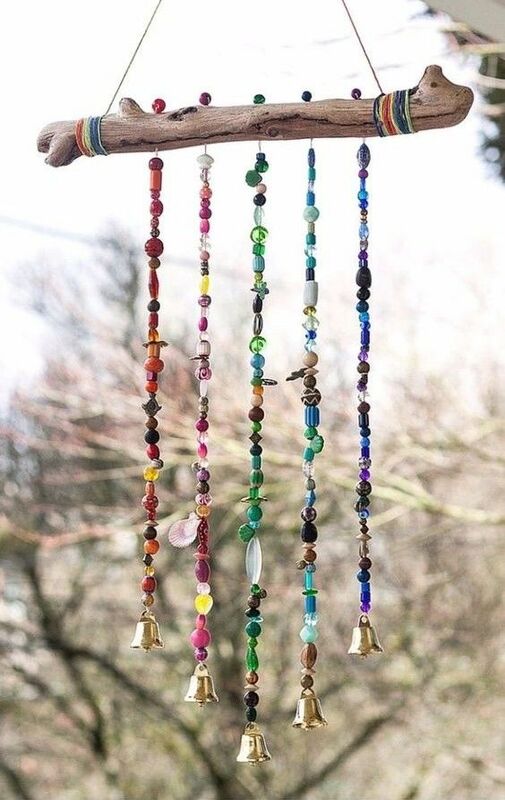 The perfect make for decorating your bedroom or tent for the Summer! 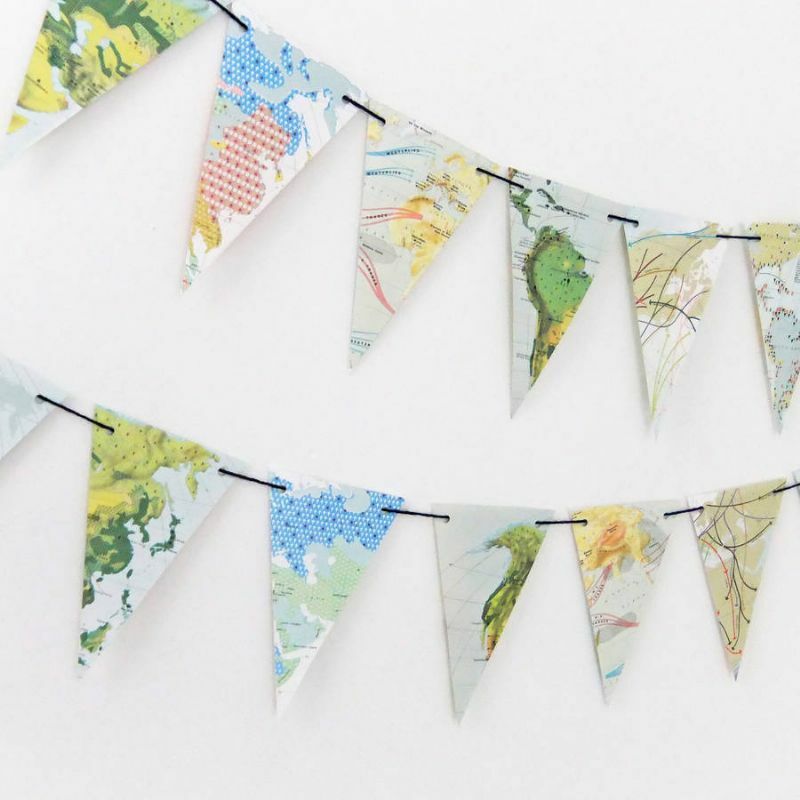 Raid our collection of patterned papers and create your own personalised bunting on this quick 1hr workshop with tutor Meg. 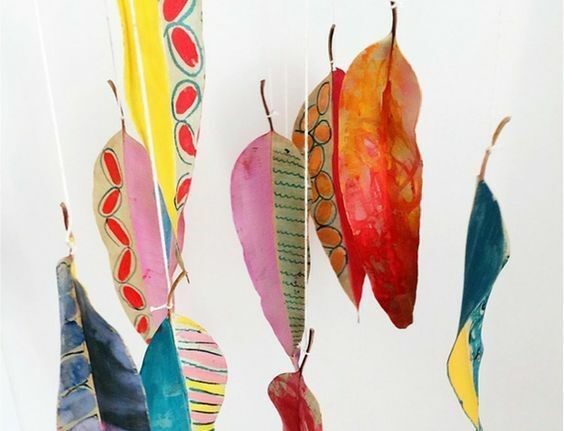 Bring the outdoors in with a with a workshop inspired by and using nature with tutor Meg! 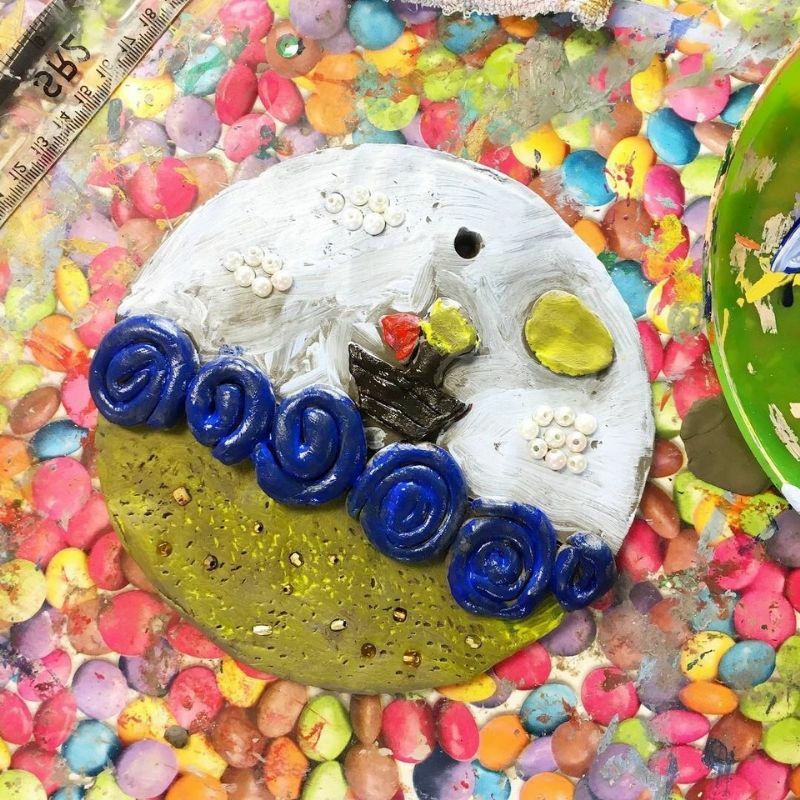 Try clay imprinting, draw fresh flowers, and paint a colourful leaf decoration! Suitable for 6+, materials included. Come and use fabrics to create a work of art. We'll incorporate texture and colour as well as machine and hand stitching. 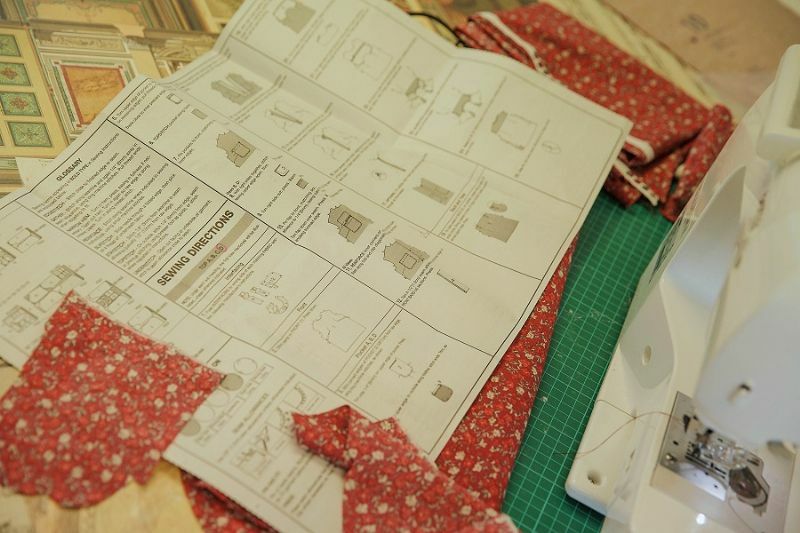 A four week dressmaking session where you can come and work on your own choice of project. This class is suitable for all levels and we are happy to give advice on good projects to tackle depending on your level. You will be given full tuition on how to lay out and read patterns, on cutting out and tackling different fabrics, and on sizing and fitting. 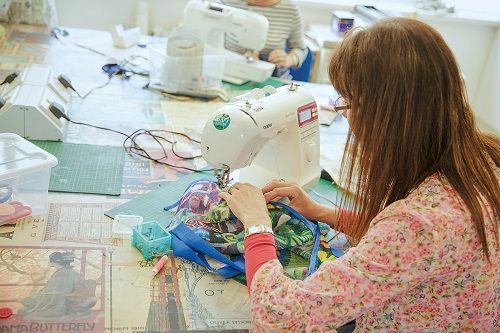 Bring your own pattern and fabric and embark on a dressmaking project in this lovely, relaxed class with full tuition. 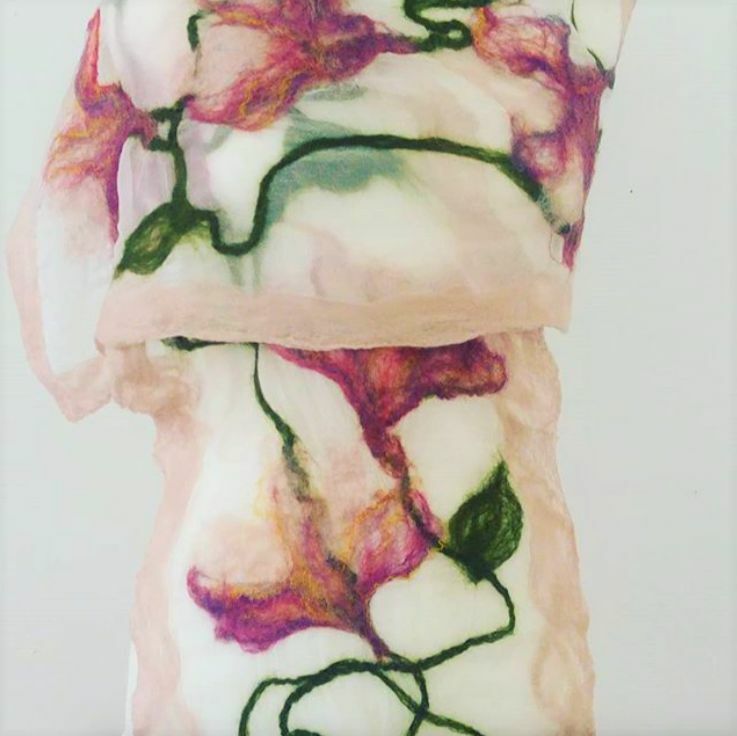 This course is suitable for all levels from complete beginner to those looking to work with trickier fabrics and techniques. We sell patterns and fabric at the Craft Centre and we are always happy to advise you on suitable projects and fabrics to choose. Just pop in and have a chat with Katharine or Hannah. Come and spend a whole day dressmaking with like-minded people, bring whatever project you would like to work on and get help with new techniques and fabrics. Suitable for all levels. 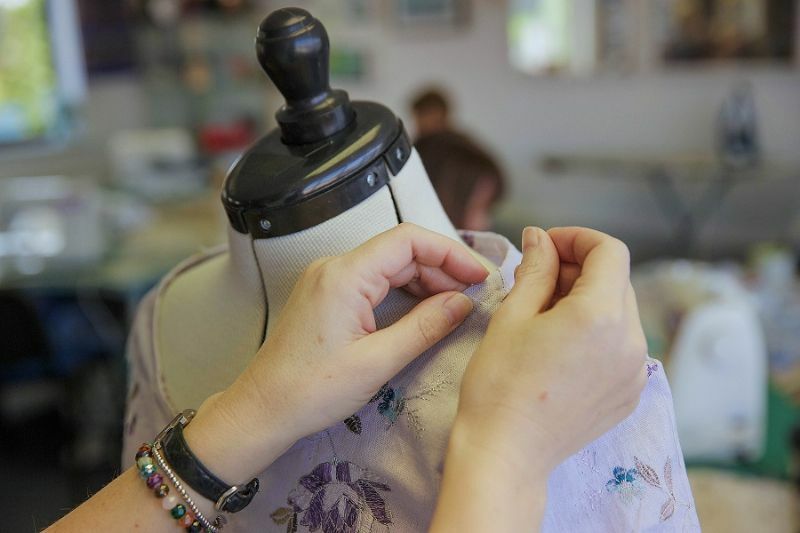 A block of six evening sessions where you will learn how to follow a dressmaking pattern and make an item of clothing of your choice (it doesn't have to be a dress!) guided by our expert dressmaker. 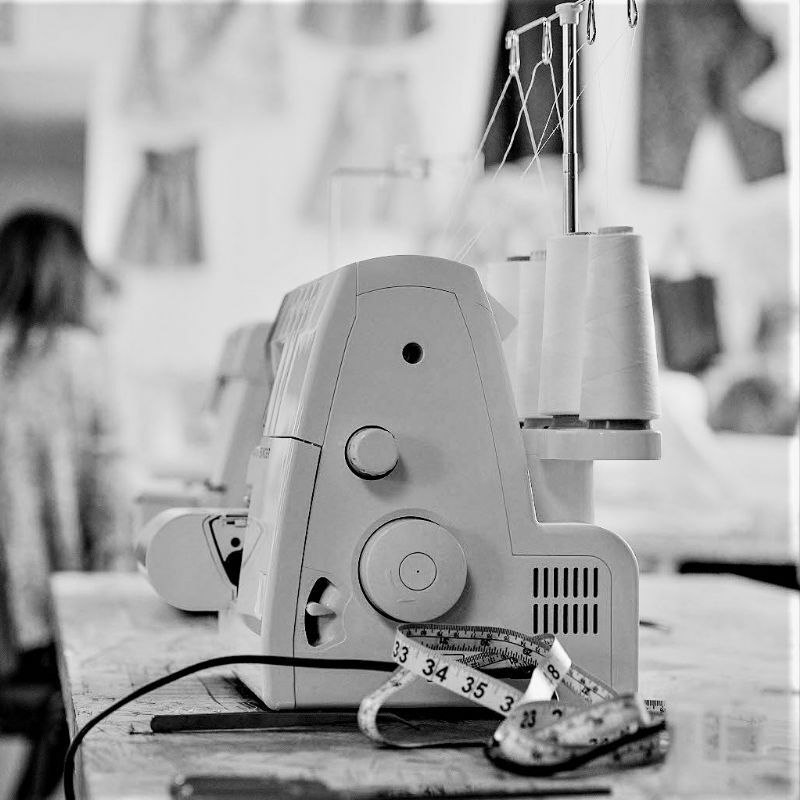 We will give what help you need at each stage, whether you are a complete dressmaking beginner and just starting your exciting journey in making your own clothes, or whether you have some dressmaking experience and would like to further your skills. 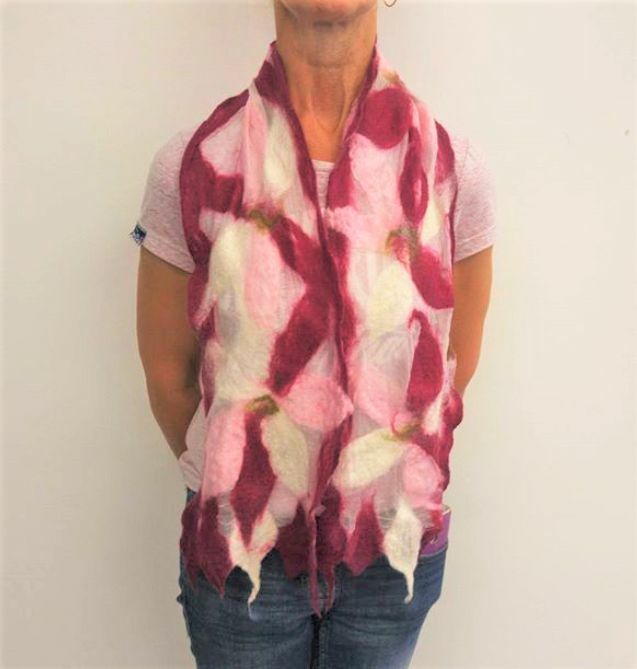 You will need to bring your own pattern, fabric, thread and notions to this course. 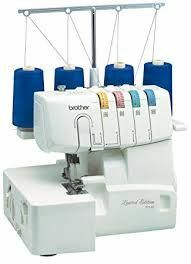 We have eight wonderful Brother sewing machines to use for this course, so you don't need to lug your machine here each week (unless you want to, of course!). We will also supply a sewing kit to use in the class (scissors, measuring tape, etc), so you have everything you need to make a fabulous garment. We sell patterns and fabric at the Craft Centre, so if you want advice on suitable projects to begin with, please come and visit and we can help you find something suitable. 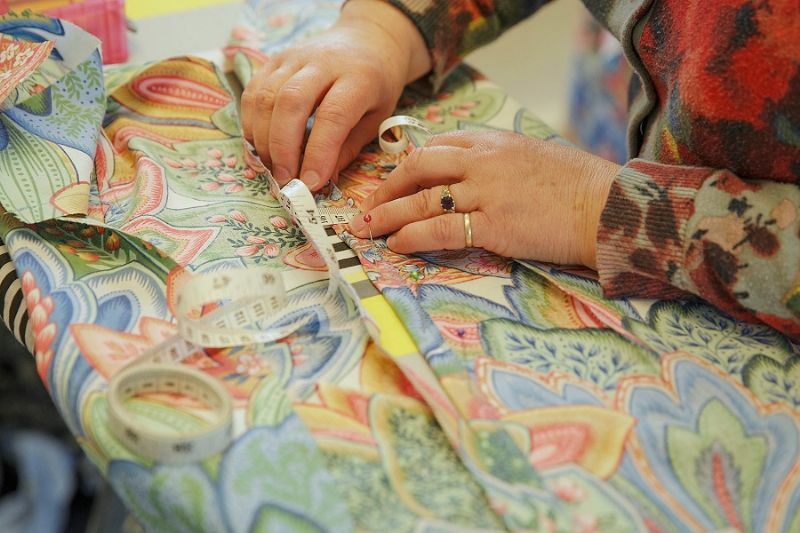 Would you like to learn to successfully pattern match your fabrics when you dress make? This full day workshop will teach you how to get the perfect finish when pattern matching fabrics. We will make a simple A-line skirt with pockets - you will be given a choice of fabrics to select before the workshop (price included in the cost of the course), and you will be shown how to lay out, cut out and sew so that you can get the perfect pattern match. This one day course will show you how to use your own measurements to draw a fitted bodice block. This will then be used to make a toile, which we will further fit and you will be shown how to transfer changes back onto your pattern. 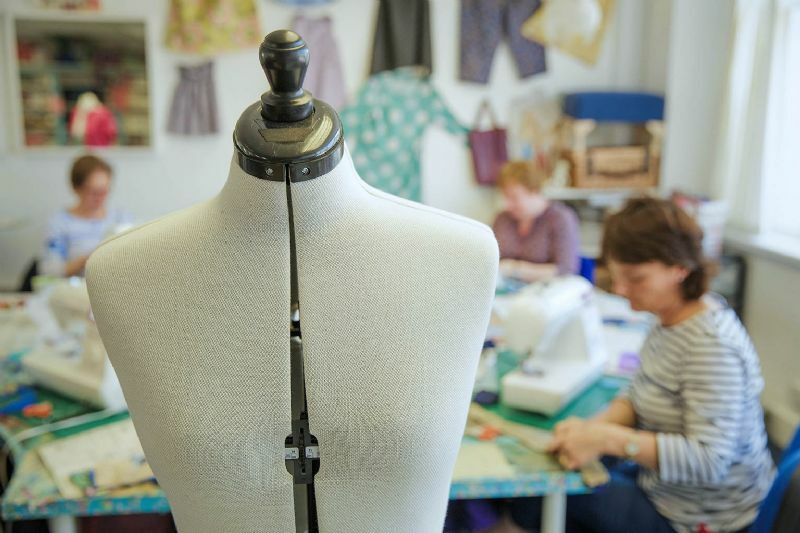 This course is suitable for those with existing sewing knowledge who want to understand more about their own body shape and made-to-measure dressmaking. Why not add on the Sleeve Block the following day? Book both bodice and sleeve courses for £100 - call us on 01858 466692 to claim this special price. If you have completed our bodice block pattern cutting course, come and learn how to draft the sleeve to go with it. You will need to bring your bodice block with you, or attend the bodice block course on the previous day to be able to do this course. Attend both days for the special discounted price of £100 - call us on 01858 466692 to claim this special price. 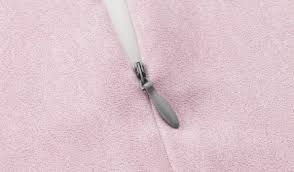 Come and perfect putting in an invisible zip - once you know how to do it, you'll never use ordinary zips again! You'll be shown how to put in an invisible zip in garments and practise doing your own. We'll also look at using them in cushions and bags and you'll go away with the knowledge and confidence to tackle any project! When you are dressmaking, choosing the right fabric for your project is a very important part of the process for ensuring a successful outcome. This session, will help you learn more about the different fabrics out there, and when to choose them. You'll also be given tips on how to best to handle tricky fabrics for a great finish. 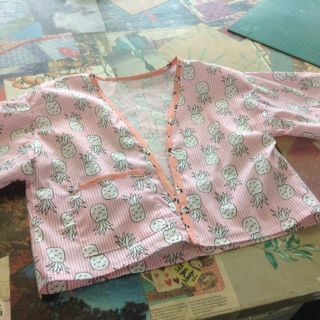 This is the perfect way to get to grips with overlocking - learn how to use your overlocker to create a fabulous garment! Using Japanese pattern cutting techniques, you will measure and make a flattering jersey tunic almost entirely on your overlocker. We have four overlockers available for use at the Craft Centre, so if you want to use one of these, please call us to reserve one. Otherwise, please bring your own machine. You will also need 2 metres of jersey fabric. We recommend a ponteroma or double knit jersey if you have never worked with jersey before. We do have a selection here at the Craft Centre which you can buy in advance, or on the day. Spend a session learning to cut a pattern and sew a simple A-line skirt. 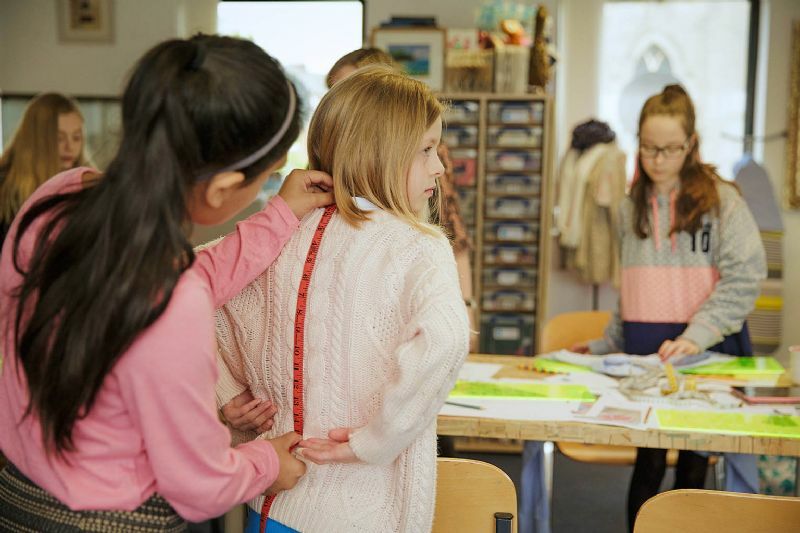 A great introduction to dressmaking. You will need to bring 1.5 metres of dressmaking fabric (either 115cm or 150cm wide), a 7 inch zip and matching thread. Mediumweight cotton is advised. Please avoid stretchy or very heavy materials. We do have a nice selection of fabrics here at the Craft Centre so you can come and choose on the day or click here to browse our fabrics and order ready for collection on the day. An introduction and exploration of home print making. Most people are under the illusion that screen printing requires specialist equipment, and spending a lot of time and money to get good results. However, this not the case. 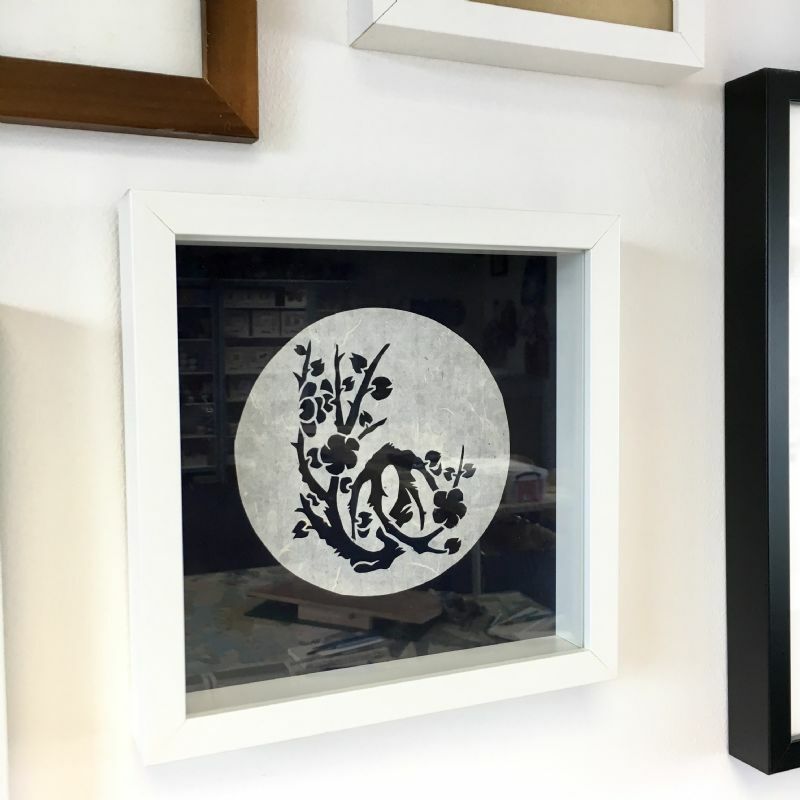 This course can give you the confidence and skills to do your own simple print making projects at home. You will also be shown how to make two colour prints. 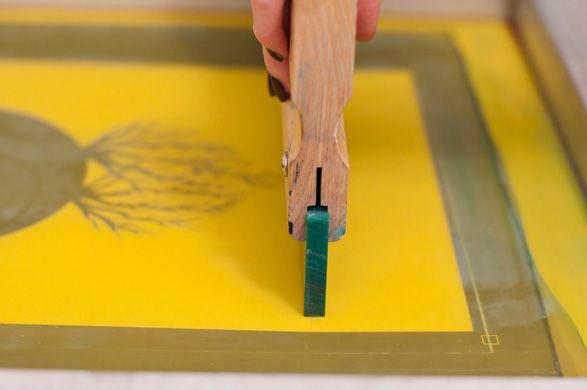 The session will be split into three parts: building the screen, making a stencil for printing, followed by printing with the newly built equipment. Learn how to wet felt and sculpt amazing flowers that can be used as brooches or decoration. Choose from our wide range of wool tops to create your own beautiful flower. Relaxing and therapeutic - take your sewing skills back to basics and make a beautiful, tactile piece of art. 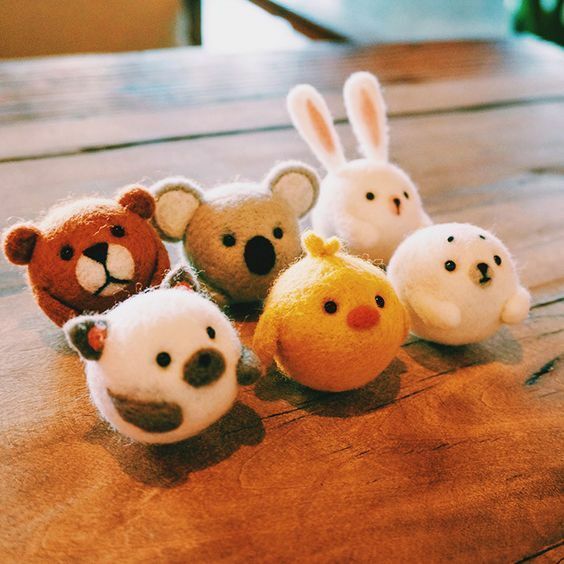 Needle felting is the process of stabbing wool fibres with a barbed needle to create felt which can be sculpted into different shapes, or used to decorate wet felted pieces. During the workshop you will learn the process and make your own needlefelted animal. A wonderful introduction to the beautiful art of weaving. This workshop will show you how to set up your loom, different weaving techniques and you will create your own wall hanging to take away. 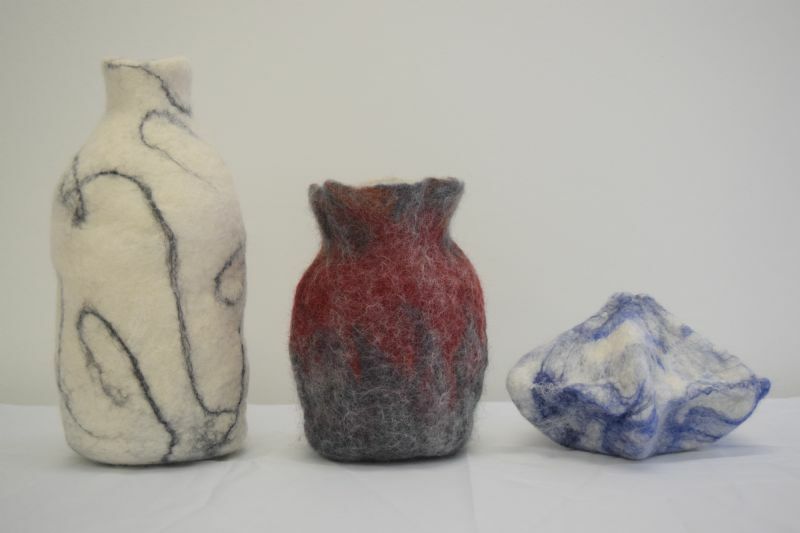 Learn how to wet felt using a resist to create a seamless three dimensional vessel or vase. Simply one of the most satisfying things you can do! 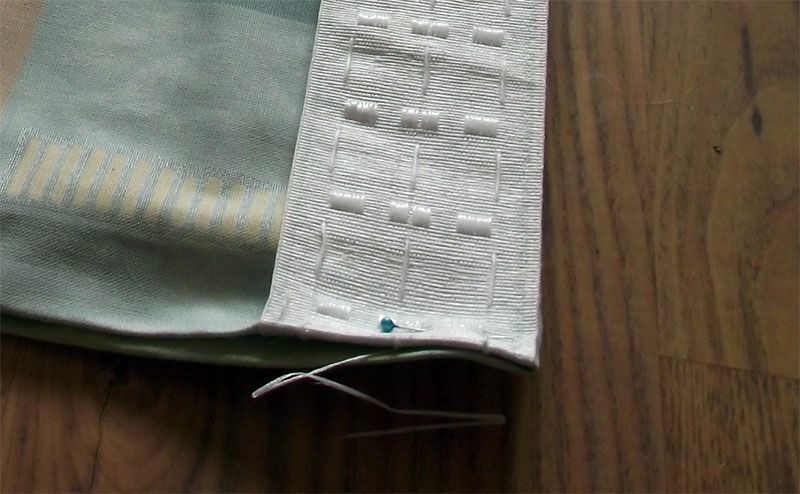 Learn how to make simple curtains with a pencil-pleat header in this useful homemaking class. In this class you will make a mini curtain and learn all the information needed to go away and make full-sized curtains for your home. In this fabulous course you will learn how to make a professionally-finished 20cm or 30cm drum lampshade. All materials are included in the price of the course, however if you have fabric of your own you would like to use, you are welcome to bring it along. You need half a metre of lightweight fabric (craft cotton weight). Learn how to make a Roman Blind on this three hour course. You will learn how to measure and calculate your folds, position patterns on your fabric, and then you will go on to make a complete sample blind to take away. You will then have all the techniques at your fingertips to be able to make blinds for your own windows. 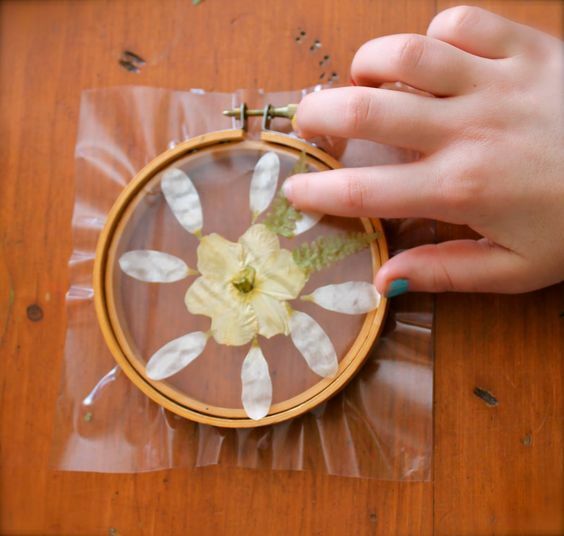 A wonderful craft for reusing fabrics rather than sending them to landfill. In this session you will learn the rag rug technique and have the choice of making a wreath, which you will complete during the time, or begin a larger project to complete at home. This three hour workshop will give you an introduction into jewellery making using the fabulous material of Precious Metal (Silver) Clay. Silver Clay is made up of very fine particles of pure silver, water and a non toxic binder. When your piece if fired, the binder burns away, leaving you with solid fine silver. It's a magical process! 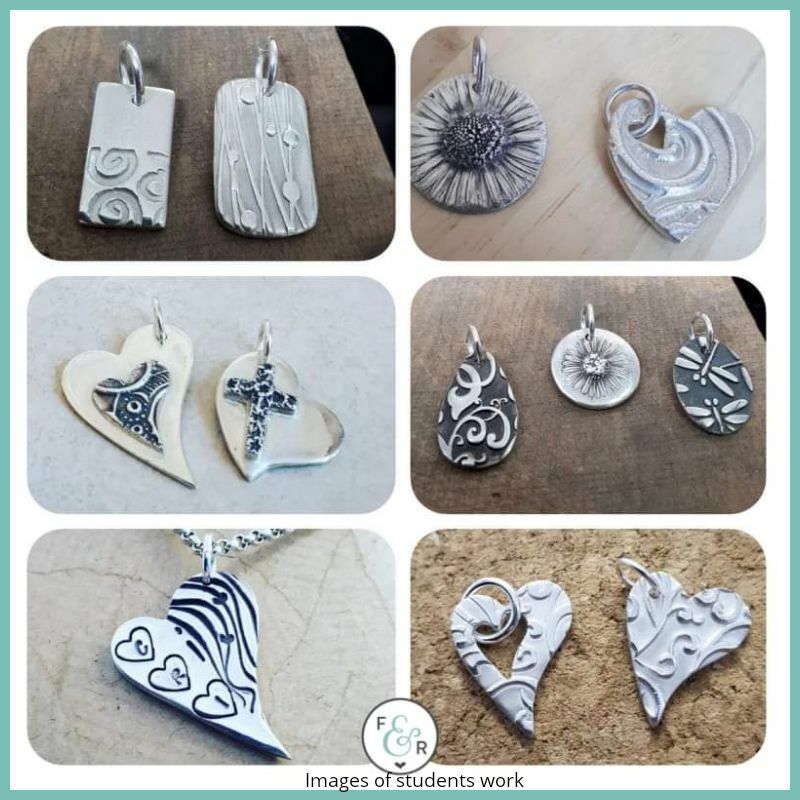 Guided by Charlotte, you'll learn the basics of working with silver clay, how to handle it, roll, shape and texture it before drying and refining, then onto torch firing, polishing and finally learning how to patina. 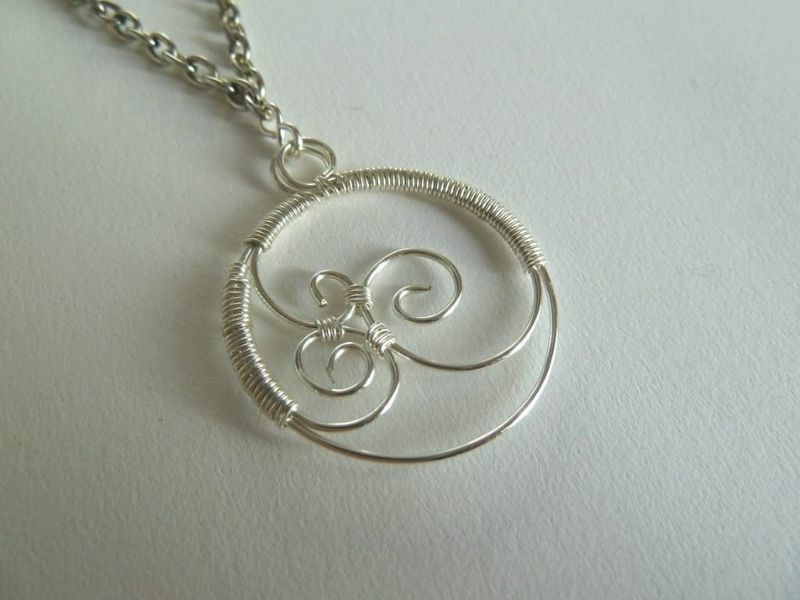 You will create one, solid fine silver pendant and it will be ready to take home with you on the day. 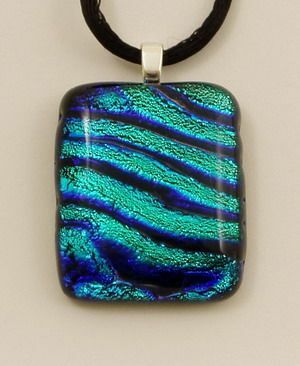 All materials are included in the price of the course and is suitable for those who are new to working with silver clay. Silver clay is made up of very fine particles of pure siver, water and a non toxic binder. When your piece if fired, the binder burns away, leaving you with solid fine silver. The process is truly magical. Charlotte with teach you how to make two textured pendants and a pair of earrings from solid fine silver. You will learn the process of making jewellery with silver clay from start to finish. The first part of the day focuses upon how to handle, roll, shape and texture it, before drying and refining. The second part of the day will focus upon torch firing, polishing and learning how to patina. Our popular silversmithing course runs as an evening course so you get even more time to create beautiful jewellery! 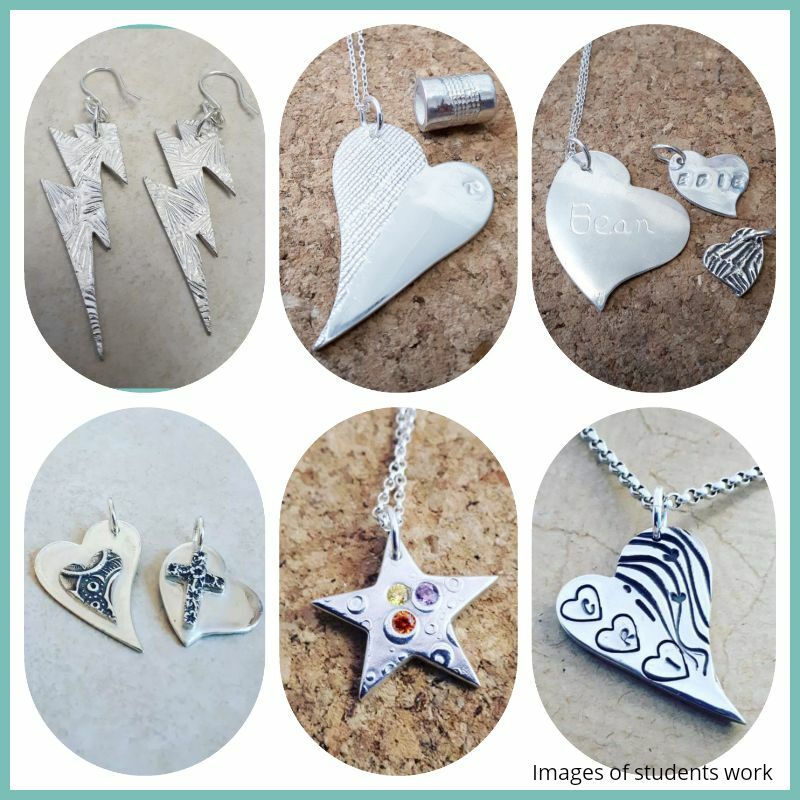 You will be shown how to work with silver, and get to try a variety of techniques including cutting, etching, filing, soldering and engraving. Complete beginners will start by making a silver pendant. Those who have attended one of our day courses or evening courses before can move on to making rings and earrings. More advanced students can have tuition in stone setting. The course price includes two pieces of silver and unlimited brass and copper. More silver can be purchased from our tutors if required. This course is booked directly with our Course Tutors - click on the date you require and you will be taken directly to their website. Getting married? Would you like to learn to make your very own special wedding jewellery or tiara for a bride and bridesmaids? In this bespoke session you can choose to learn how to create beautiful bridal jewellery or a tiara. We can show you how to create your own design of wedding jewellery, including how to knot pearls and to make earrings. We will tailor make the techniques used and designs to suit your theme and style. Or, you can learn how to design and make a bridal tiara, including how to make made-to-measure headbands, learn wire twisting and beading techniques. Then you will have to opportunity to make a tiara to your own design using Swarovski crystals and pearls. Specify your style and colour scheme before the course and we will ensure we have the right colours in stock. This session is organised on a bespoke basis either as a 1-1 session or with a small group of friends. Contact Katharine on 01858 466692 to book a workshop, or commission your pieces. Come and learn how to arm knit using amazingly soft chunky yarn. 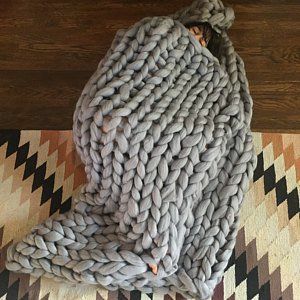 You will be taught the basics of how to cast on, knit and cast off and will either complete a chunky cushion or small blanket, or begin a larger blanket. The cost of the yarn is not included in the price of the course. When booking we will ask you to pre-order your colour and quantity of yarn depending on the size of item you would like to make. Colours are: candy floss, scarlet, duck egg, teal, pewter, lavender, cream and light grey. 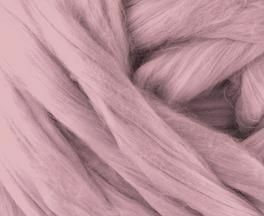 The yarn is vegan friendly acrylic jumbo yarn, so also suitable for those sensitive to wool. This is a course perfect for crochet beginners, or those who have come to our crochet taster workshop. In this course, we will teach you the most commonly used crochet stitches, show you how to begin and finish a piece of crochet and talk about colour choices of yarns. You will learn how to read a crochet pattern, how to make granny squares (which can be put together to make a cushion cover or blanket) and become more confident at selecting crochet projects to move on. 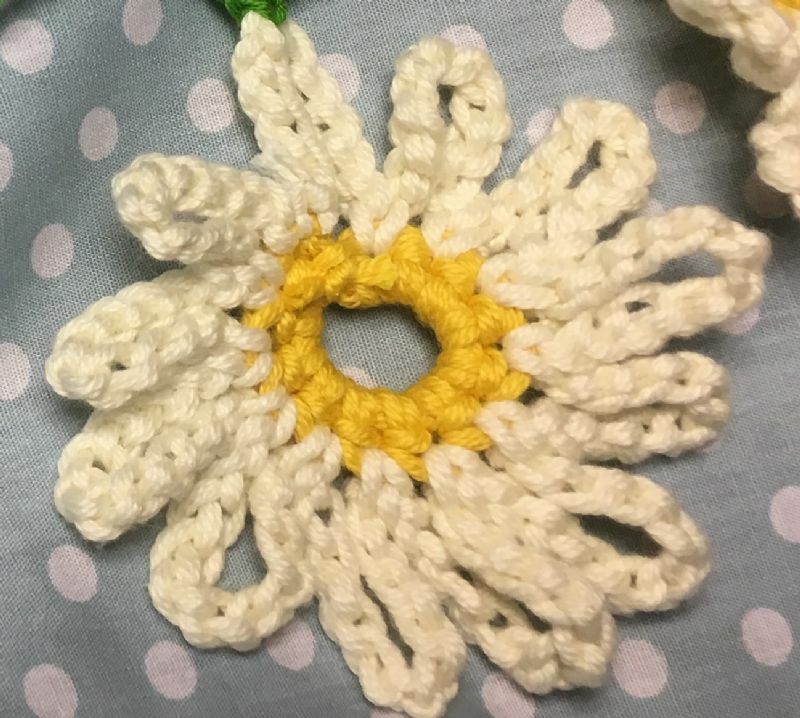 Included in the price of this course is a crochet hook and ball of yarn in the colour of your choice, and a clearly written pattern for a granny square. If you have attended this course already, or have some experience of crocheting, you are very welcome to come and we will develop your crocheting skills further with more complex pattern reading, crocheting in the round and learning more complex stitches. Just mention at the time of booking if you would like to be stretched further! Take your crochet skills to a new level with free form crochet or 'scrumbles'! Perfect for using up yarn scraps and taking crochet to a wonderful textural level you can create amazing textural forms and fabric. 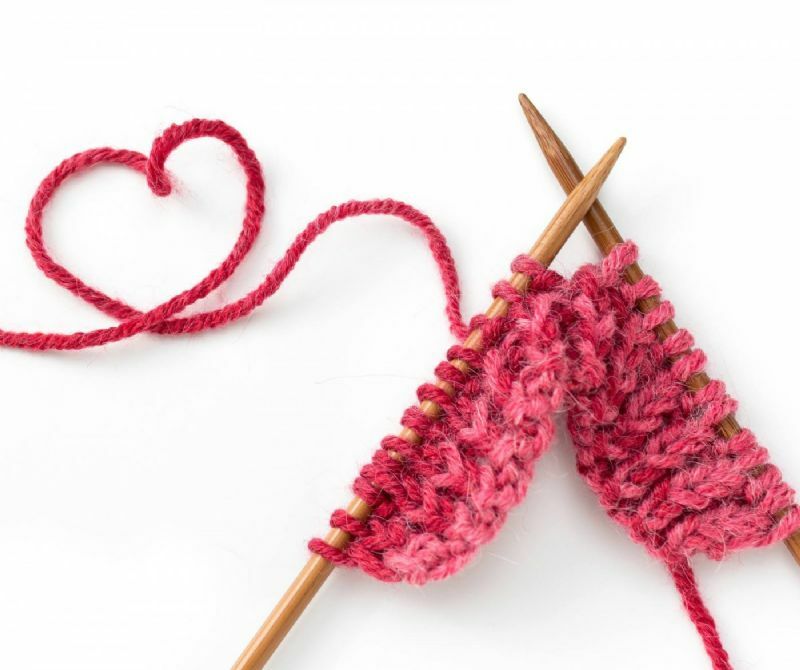 Knitting is a wonderfully relaxing and mindul craft. In this two week course, either come along and learn the basics, or if you can already knit, learn other techniques to advance your skills. Two evening classes where you will learn the basic stitches, learn how to make a granny square and begin to read crochet patterns. More experienced crocheters are also welcome if you wish to progress your skills further. A fantastic workshop on the art of glass fusion - using pieces of glass to create beautiful pictures. You will be shown how to cut glass and use stringers and frit to create your own design. This will then be taken away and fired in a glass kiln and your finished piece will be ready to collect from the Craft Centre approximately one week later (this will be confirmed during the course). A beautifully effective craft that everyone can do. It is suitable for both complete beginners and those who have attended a course in the past. More experienced practitioners can work on a project of their own choice during the session. 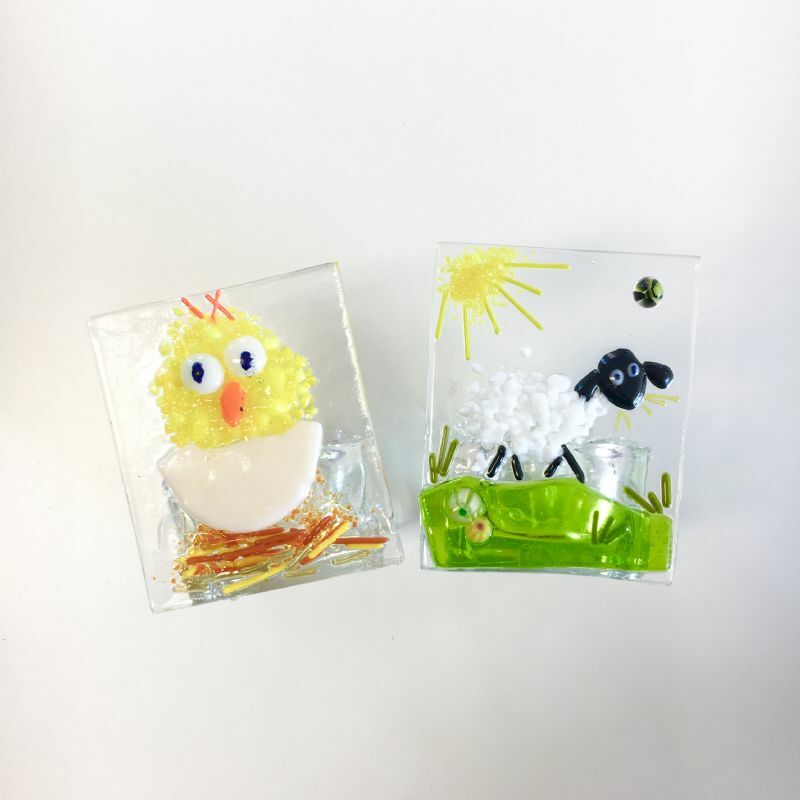 If you've tried our shorter glass fusion courses and loved it, then this is the course for you! 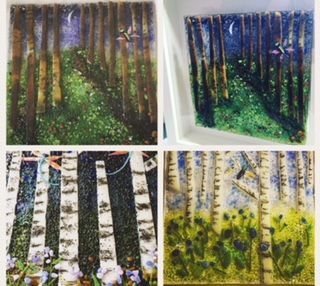 And even if you haven't then this four week course is a great introduction to the art of glass fusing. Working from beginner to intermediate level you will learn how to cut lines and curves into sheet glass. You will get the opportunity to work with glass in many forms including glass paint, crushed glass (frit), dichroic and iridised glass. Those with more experience, who have attended this course before are welcome to return and work on their own designs and build their skills with Sarah. Learn all about glass fusion and creat your own lantern in the process. During the session, you will create 4 pieces of glass art that will be taken away to be fired and then used as the 4 walls of a lantern. This course is suitable for beginners with no experience of glass fusion, or for those who have been on a glass fusion course before. Whip up an on trend macrame plant hanger with Meg on this longer course where you can really get to grips with knots and tassels! 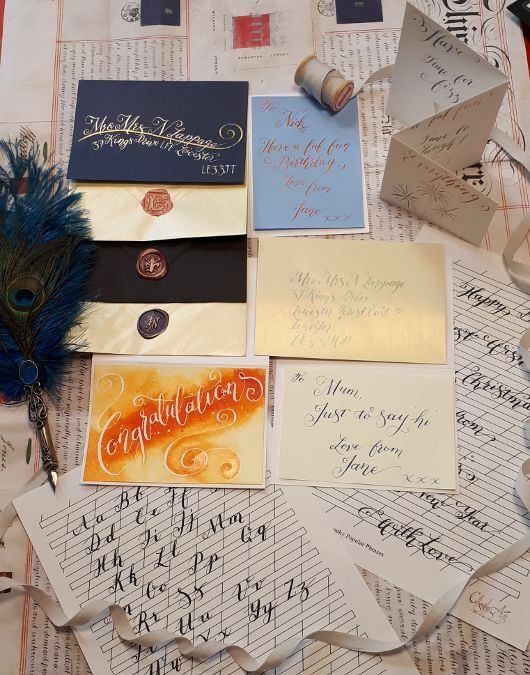 On this full day Modern Calligraphy course you will learn the basics of the script in the morning and in the afternoon you can put your new skills to work by creating a card or picture. Fabulous for special occasions and wedding ideas. You can also learn how to use gorgeous metallic inks to make your work look AM-AZE-ING! A basic pen holder, nib and practice sheets are all provided in the cost. Pyrography is the art of burning designs into wood - come and have a go and make a wooden decoration! 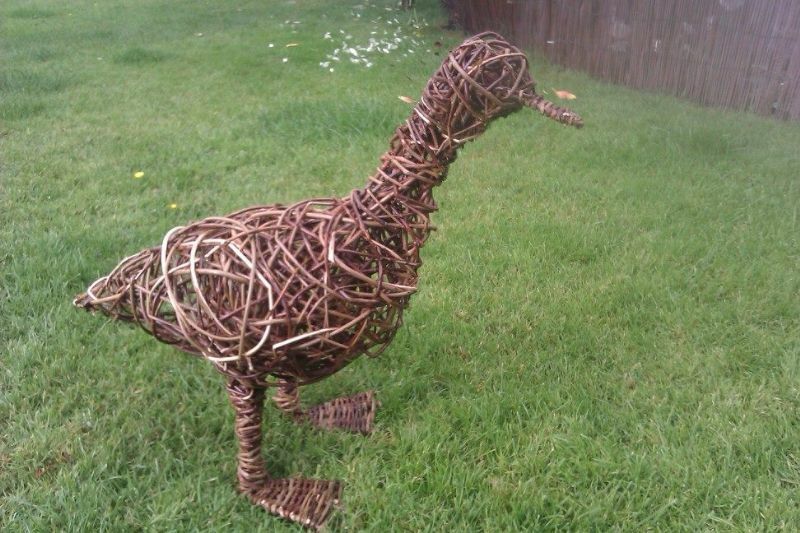 This is a fantastic day course where you will make your own willow sculpture. No experience is necessary. If you are new to the craft, you will be given the choice of making a duck, runner duck, heron or chicken. Then you will be guided through the processes and techniques of sculpting from willow to complete your sculpture in the day. 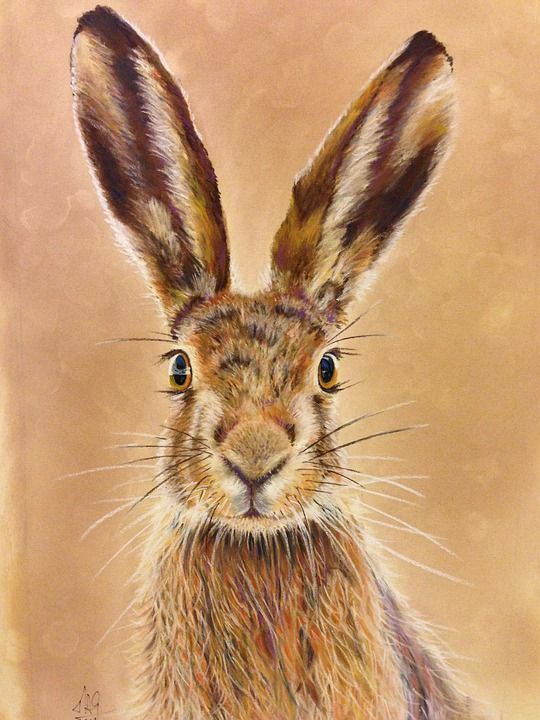 For the more experienced why not have a go at a hare, cat or even small dog or sheep. A short course for kids – drop them off while you finish your Christmas shopping. They’ll have fun and come home with some great Christmas makes. Click here to visit our Children's Crafty Kits section of our shop. 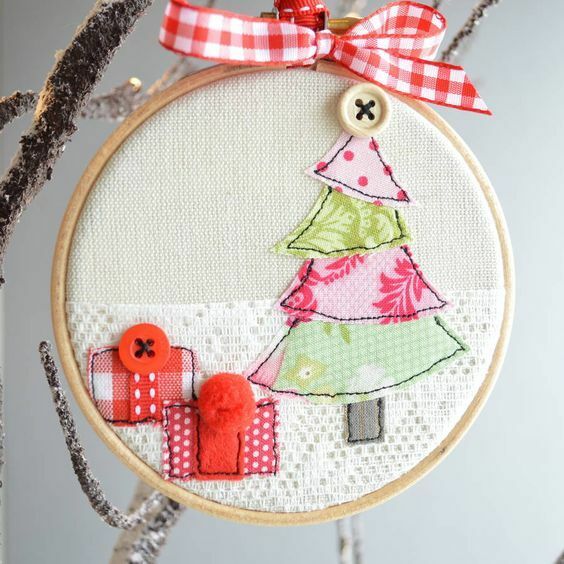 Use our sewing machines to stitch a gorgeous Christmas design with festive fabrics, then frame in an embroidery hoop to make a lovely gift or decoration. All abilities welcome. Materials and inspiration included! 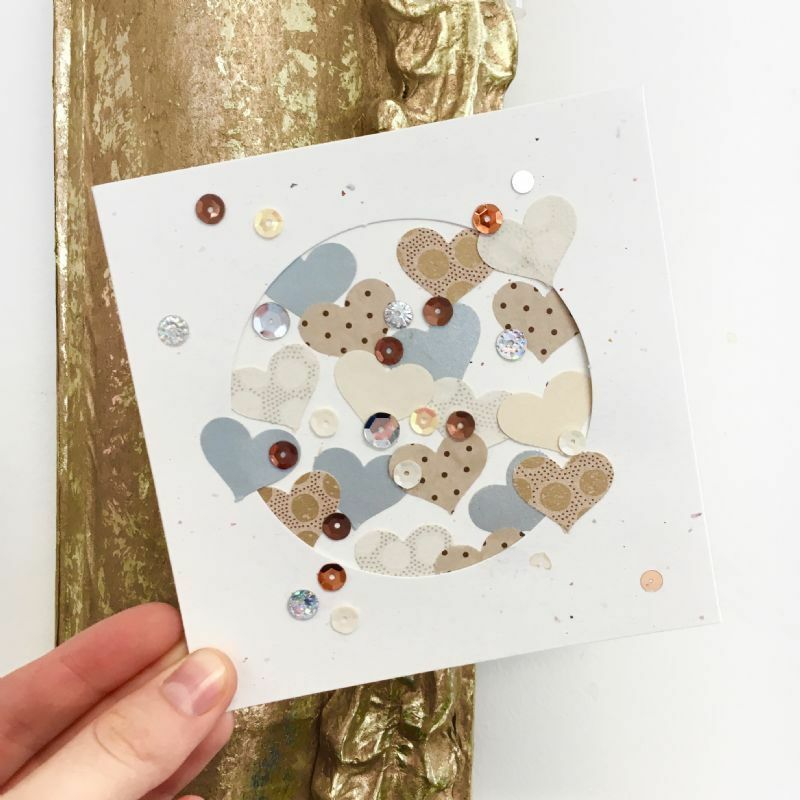 Get ahead with your Christmas preparations and spend a peaceful hour and a half using our card-making materials to make some unique handmade cards - from paper collage to delicate watercolours! An afternoon of relaxing Christmas Crafts! Have a go at a rag wreath and make your own unique, handmade decorations using all of our festive crafting materials. See how much you can make during the session! Materials, guidence and inspiration provided. Christmas Craft & Fizz Evening! 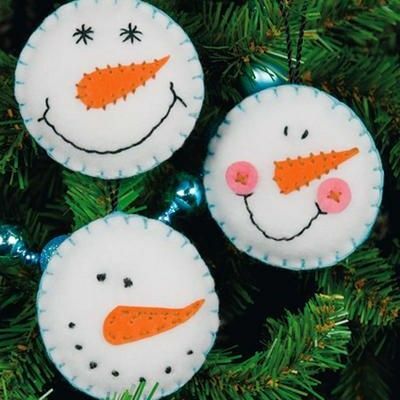 A fun seasonal workshop where you will make four or five lovely Christmas decorations to take away. We'll also be serving mince pies and fizz, so why not bring your friends along for a fun evening out! Click here to visit our shop for Christmas craft kits and supplies. This is a four week course where you will learn how to piece and applique a Christmas table runner. We are delighted to welcome Nina, essential oils expert, to provide us with a Christmas workshop that will enhance your health and well being. 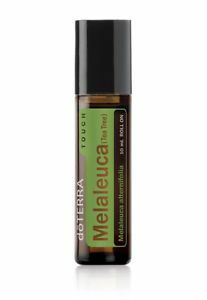 Essential oils from doTERRA help with wellness for all the family. Pure therapeutic grade essential oils can be used to support sleep issues, boost immunity, digestive issues, anxiety over work and life, encourage focus and much more. In this workshop, you will learn a little about essential oils and then choose a blend to make into a room spray. We will go on to make a paper Christmas decoration that can be sprayed with your blend to scent your room for the festive season. 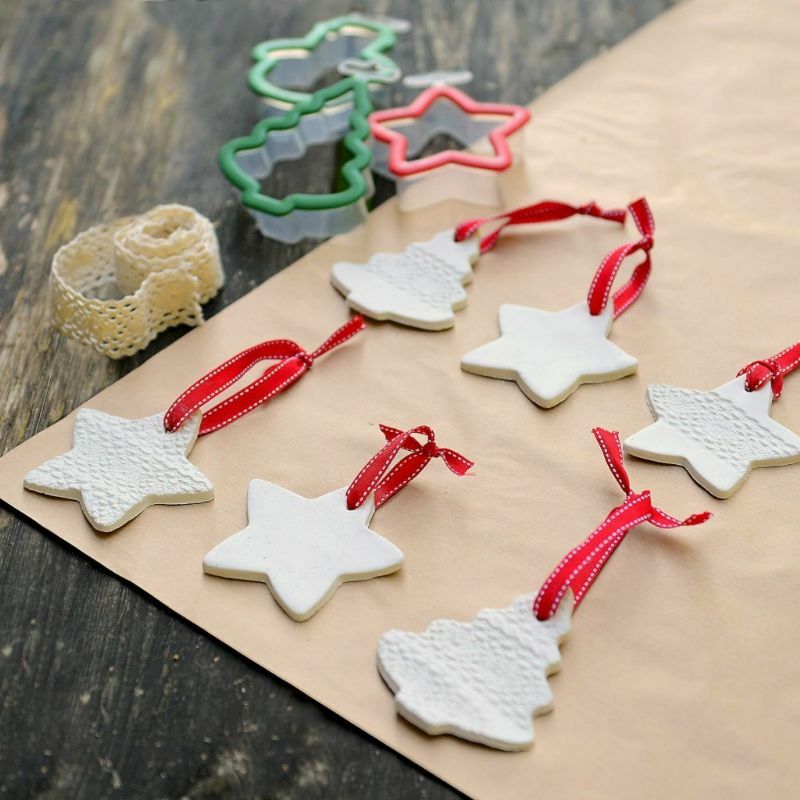 Come and make some clay Chrismas decorations for your tree, cut from air drying clay and decorate with imprints, stamps and texture. Come and learn how to make your own fresh Christmas wreath with award-winning Millies Forever Floral. The finished decoration will see you right through the festive season and equip you with the skills to make them year-on-year! We'll be serving mince pies and fizz to get you in the Christmas spirit, so bring your friends along and make a night of it! 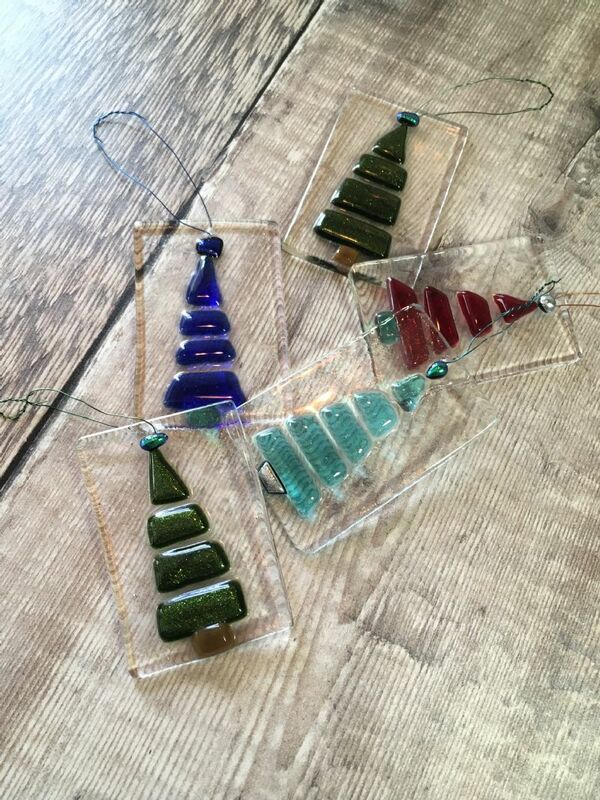 Learn all about glass fusion and create your own beautiful pieces of glass art for Christmas Decorations. Your glass will be taken away to be fired and returned to the Craft Centre for collection in a few days. 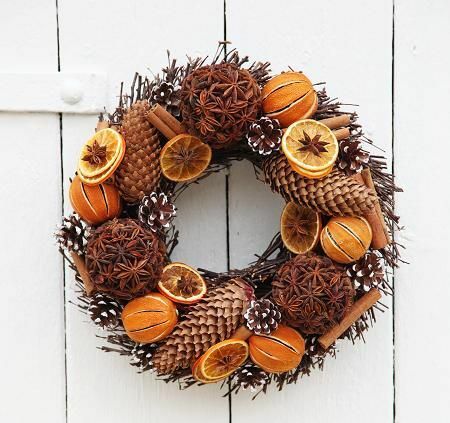 Come and spend a peaceful two hours making a beautiful rustic wreath. We'll start with a wire base adding hessian, pine cones, dried oranges and more to make a lovely traditional piece for the festive season. Make the perfect Christmas scene with your very own magical Elf Door! 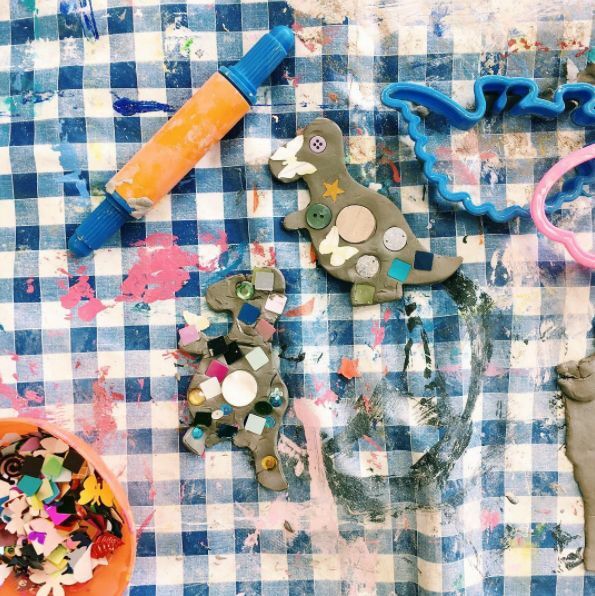 Mini Makers is our weekly arty crafty session for pre-schoolers (suitable for those aged 2-4 years). 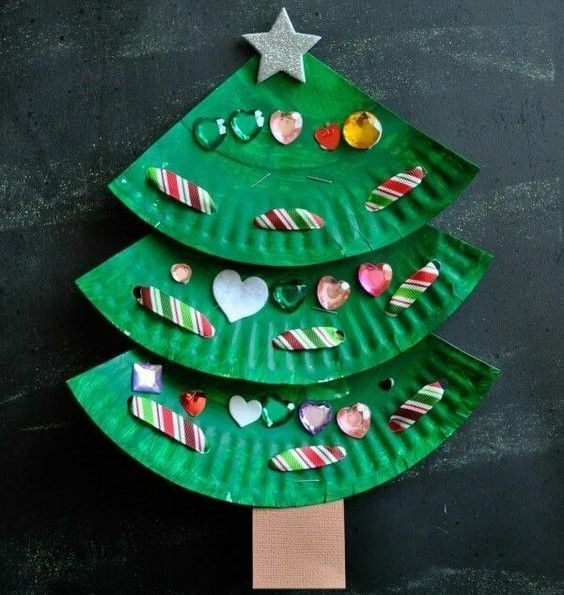 This time, join us for three weeks of extra special Christmas crafting with your little ones! 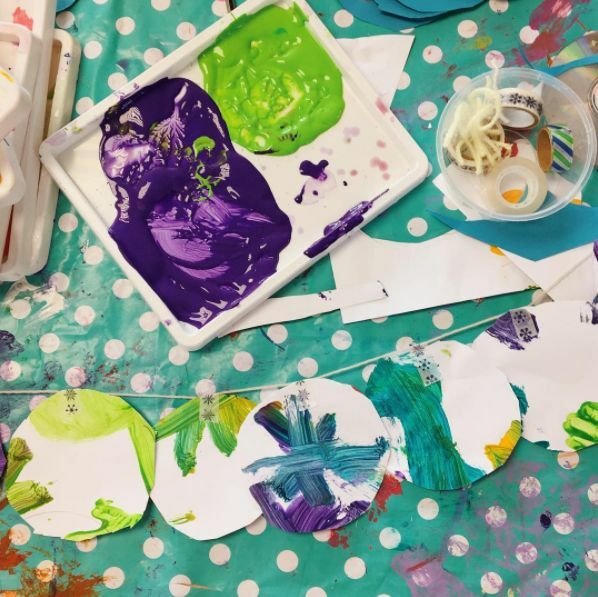 We try painting, sticking, modelling, stamping, snipping and lots more; all designed to develop your child's fine motor skills and creative thinking. The small and relaxed groups are run by Hannah, a qualified primary school teacher, with heaps of experience of working with young children. Tea & coffee is provided for the grown ups, and a drink and biscuit for the children. 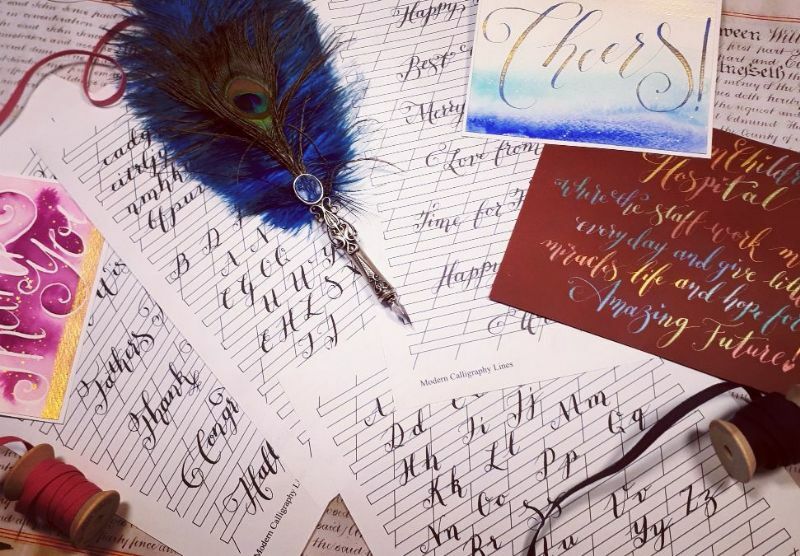 A full day workshop where you will learn 'Modern Calligraphy' brush lettering techniques and use them to layout and complete a personalised 'Glitter bauble'. In the morning you will practice your lettering and begin to think about your design. 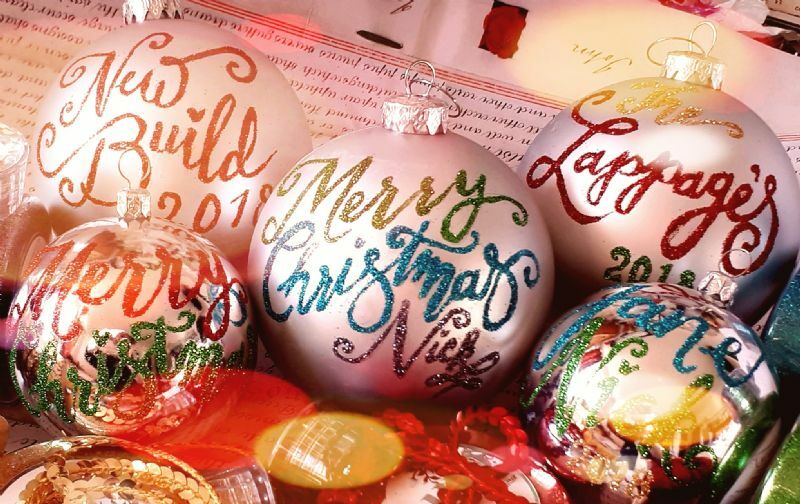 In the afternoon, you will transfer your design onto your bauble and add glue and glitter. All materials are included to practice and complete one bauble - extra baubles can be purchased on the day if you wish. Please bring a packed lunch. There will be plenty of tea and coffee available throughout the day. 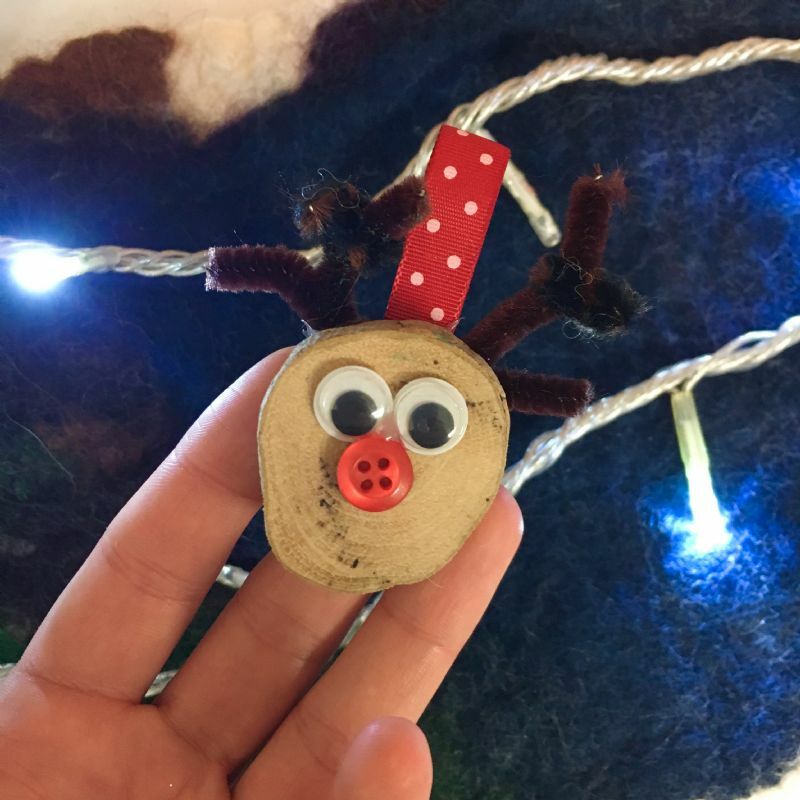 Perfect for a Christmas tree, come and make a fun needlefelted decoration in this workshop. We will show you how to turn the fluffy wool tops into a cheeky pudding, using needlefelting needles. Come and make a cute little needlefelted robin for Christmas! 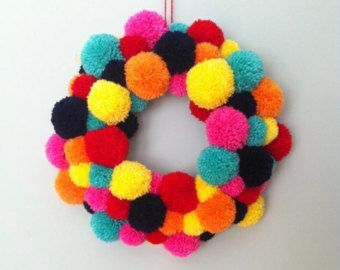 The pompom trend isn't going away, so come and make a fun Christmas wreath with them! A great modern twist for an indoor wreath...pick your colour scheme to suit your home. 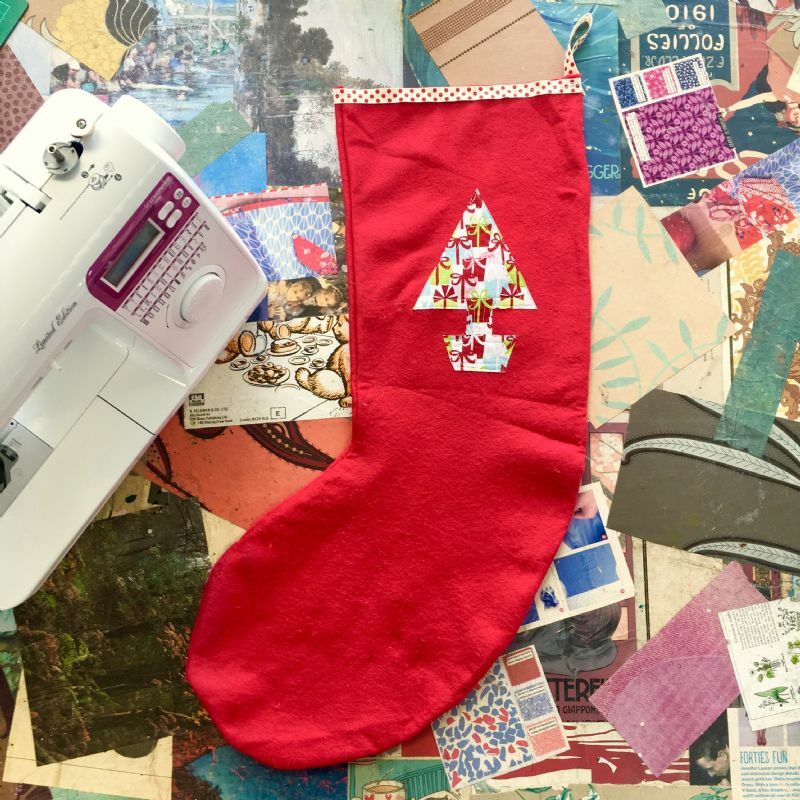 Suitable for children or adults - come and make yourself (or a loved one) a full-sized Christmas stocking with personalised applique designs, using our modern Brother sewing machines. 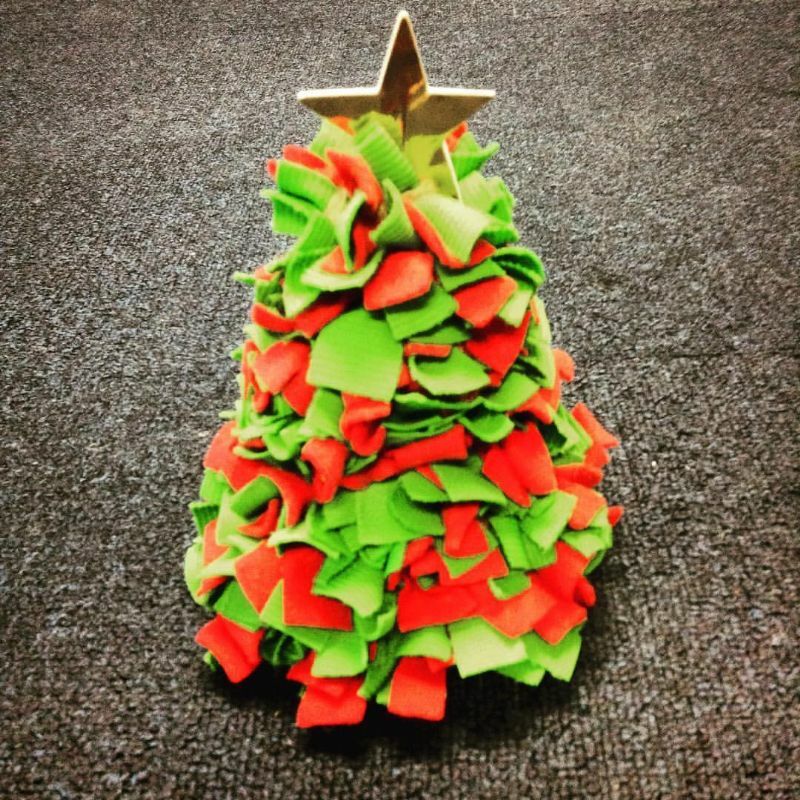 It's never too early to craft for Christmas! In this day session, you will make a beautiful quilted advent calandar, perfect to hide mini surprises for your children or grandchildren in the run-up to Christmas. There are two Advent calendar designs to choose from: a Scandinavian-inspired Christmas tree or a traditional house design. You can select your choice of design when you book. 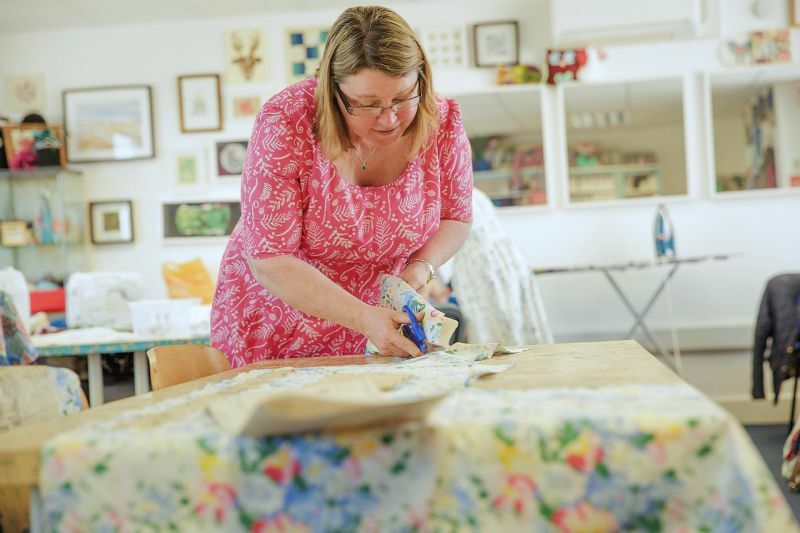 If you have ever wondered about the difference between patchwork and quilts, or how quilts are made and fancied having a go, then this one day workshop is for you! We will take you through each step of patchwork and quilt making and you will spend the day making your own mini quilt. 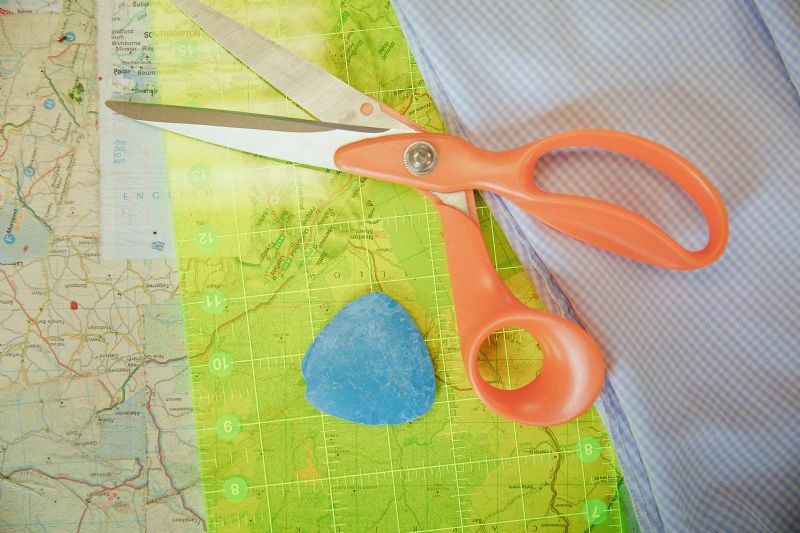 You will learn how to cut squares of fabric with a rotary cutter, how to fit and sew them together to make a patchwork top (and how important an iron is in quilt making!). You will then add wadding and backing fabric to your patchwork top, and use a sewing machine to learn some basic quilting. You will then finish your mini quilt with a border. All materials, equipment and sewing machines are provided for your use on the day, as well as plentiful tea and coffee. There will be a break for lunch so you can bring a packed lunch, or pop into the town for a breath of fresh air. Click here to go to our shop where you will find patchwork tools and fat quarter fabrics. A four week course for anyone who wants to learn to sew! We'll complete a project a week, developing and building your skills as you go. You don't need your own sewing machine, but you can bring your own if you wish. A fabulous bag for using up your stash! Made up of patchwork squares on the outside and lined on the inside with leather straps for a touch of class, this is a great make for all your summer gear. Suitable for all levels. All materials are included in the cost of the course, plus a pattern to take away with you, so you can make more! Not keen on precise cutting and pieceing in your patchwork? Come and have a go at crazy patchwork where anything goes with stunning results! Perfect for making applique pieces and using up scraps. 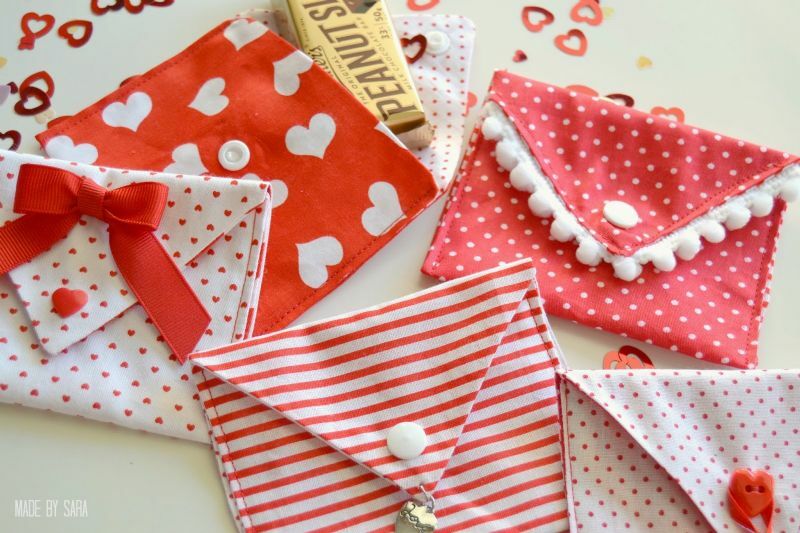 Learn how to make fabric envelopes and Japanese Bento Bags that have a multitude of uses - great for putting gifts in, or keeping jewellery safe. 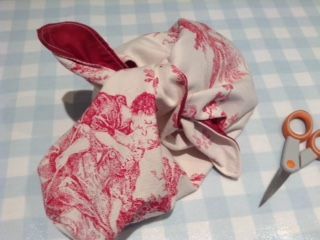 A lovely quick make perfect for using up scrap fabric too! A great introduction to working with leather and combining it with other fabrics. You will create a lined and zippered clutch bag made with beautiful soft leather and coordinating fabric. Always wanted to tackle a larger quilt but been afraid to try? Want to join a like-minded, social group stiching together. Over 10 weeks we will make a large quilt from start to finish. You'll be guided through the whole process of cutting, piecing, quilting and finishing. 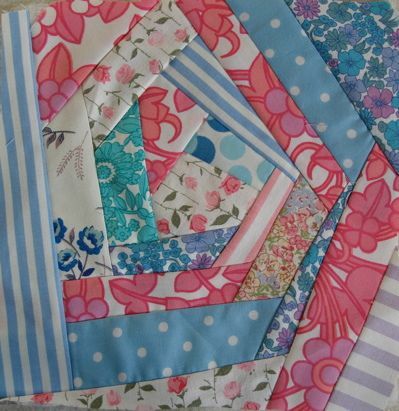 In the Summer Term, we will be tackling a pieced patchwork quilt using jelly rolls and fat quarters. Pojagi Patchwork is a Korean form of patchwork that requires no wadding or backing as all seams are enclosed. Traditionally sewn to use leftover fabrics and turn into wrapping cloths, today it is often used for decorative as well as practical pieces. Have you just bought yourself an overlocker? Not sure where to start? Book a 1-1 session with us and we will help you get your machine threaded and set up ready to sew. Call us on 01858 466692 to book your session. 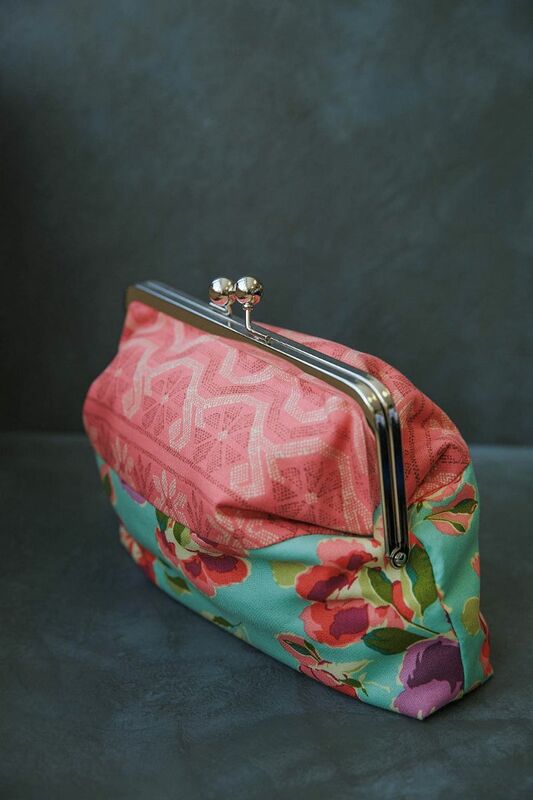 In this workshop, you will learn how to make a fabric make-up bag with a clasp fastening. 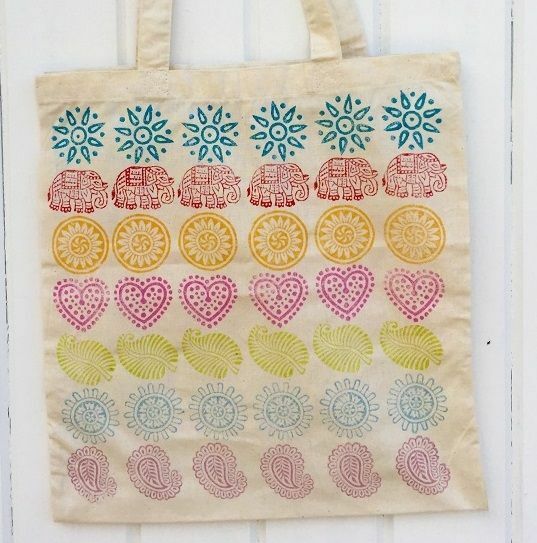 This is a lovely project that is perfect for those who have never made a bag before. 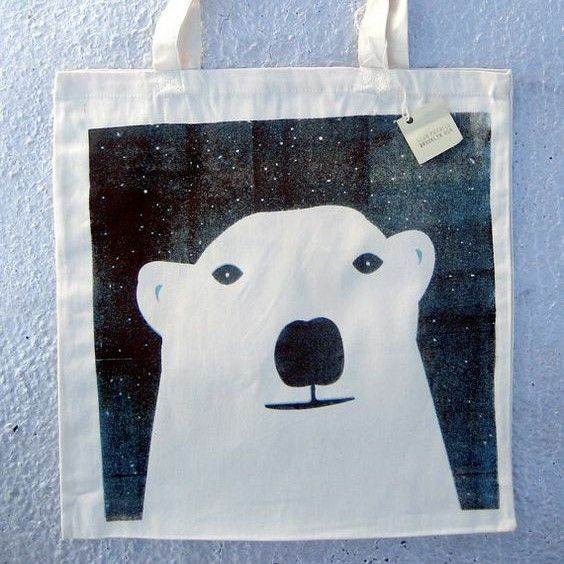 You will have great fun rifling through our extensive collection of fabric to choose two designs for the outside of the bag, and a third design for the bag lining. You will learn how to sew the bag on a sewing machine, how to give structure to the bag and how to attach a clasp fastening. All material choices, wadding, the clasp fastening and the pattern pieces are included in the price. You will leave with a finished, beautifully-made make-up bag. 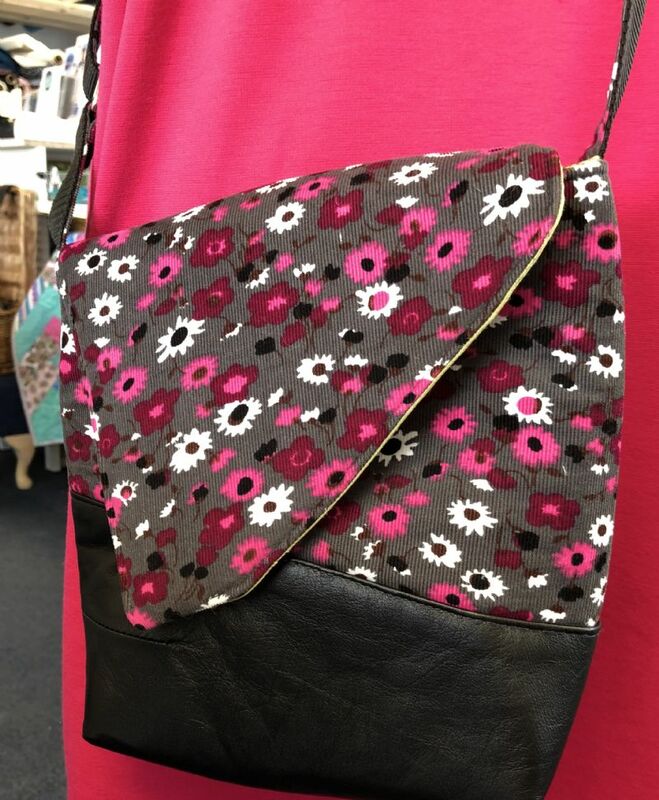 A great one day course where you will hone your bag making skills and come away with this wonderful Squiffy Sling messenger bag, pattern by Mrs H. The price of the course includes a pattern to take away, bag hardware (magnetic fastener, handle webbing and strap pieces) all the interfacing and fusible foam required for the small Squiffy Sling. You are very welcome to tackle the large Squffy Sling, though there would be a £4 fee to add on to cover the extra interfacing and fusible foam needed (payable on the day). You will need to bring fabric of your choice and a 7 inch zip that matches your lining fabric. 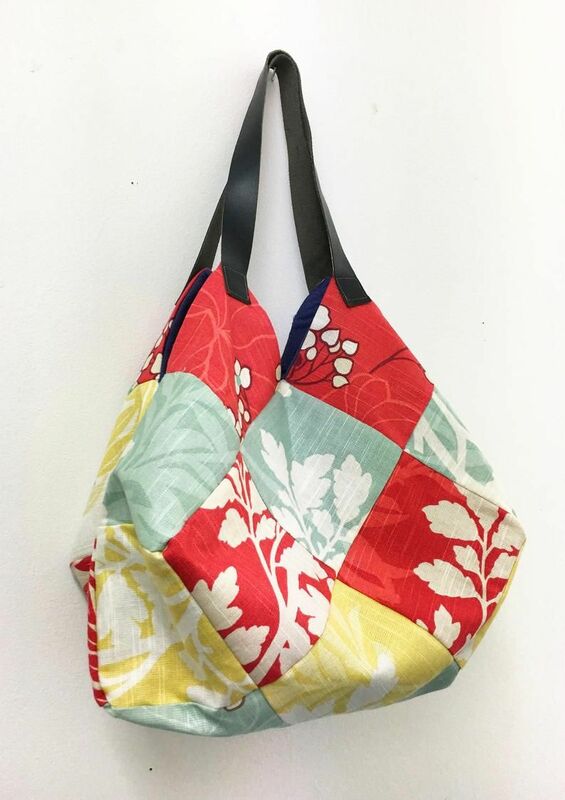 The pattern uses leather (real or faux) for the base of the bag exterior: however the pettern will work equally well with a contrasting fabric if you prefer. 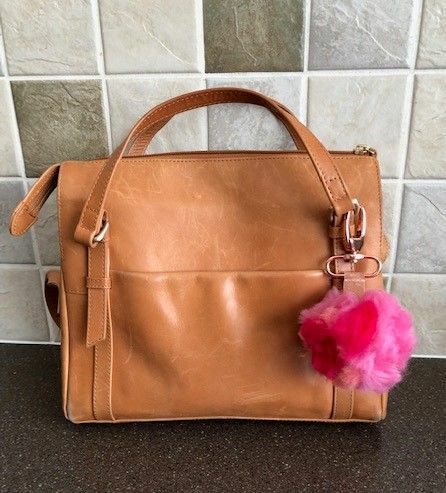 For the bag in the photo, leather from a pair of charity shop leather trousers was used! If you do choose to use leather, it needs to be thin and supple so the sewing machine can cope with it. If you have any queries about choosing or using leather, please contact us and we will be happy to help and advise. For the bag exterior, you will need fabric with a bit of strength - corduroy, linen, denim, thicker cotton (the bag in the photo uses corduroy). Most fabric will be suitable for the lining. Small Squiffy Sling: 0.5 metre needed for exterior, 0.5 m for the lining, 0.25 m for the bag base (leather or a contrasting fabric). Large Squiffy Sling: 0.75m needed for exterior. 0.75 m for the lining, 0.5m for the bag base (leather or a contrasting fabric). A wonderful technique for turning all your scraps into a beautiful piece of patchwork. This one-off class is suitable for all levels. Come and learn how to make your own espadrilles for the perfect beach look! All materials are provided and this class is suitable for all levels. Please email us your shoe size when you book. A great project for those of you who are fairly new to patchwork. Come and learn this quick and easy way to stitch triangles and make a pretty cushion cover. On this day course, you will a beautiful tweed handbag! 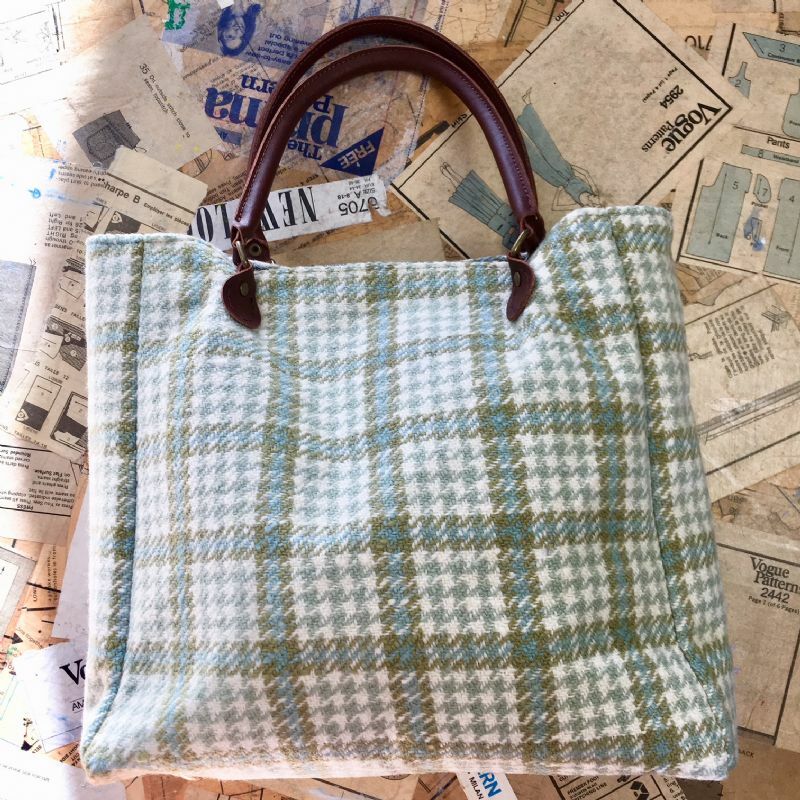 You will learn how cut tweed correctly, how to add fabric lining to a bag and the neccessary additons needed to give a bag a strong structure. 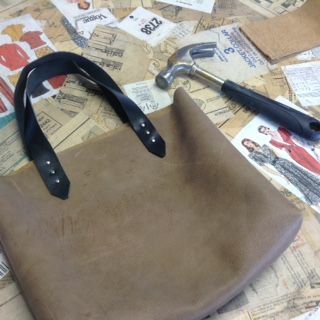 The bag will be finished off with leather straps, handsewn on. You will learn a host of bag making skills throughout the day, and make yourself a timeless classic you will just use and use. For this course, you will need 1 metre of tweed fabric and 1m of lining fabric. We will provide all other materials. The latest painting sensation, the 'dirty pour' comes to the Craft Centre. 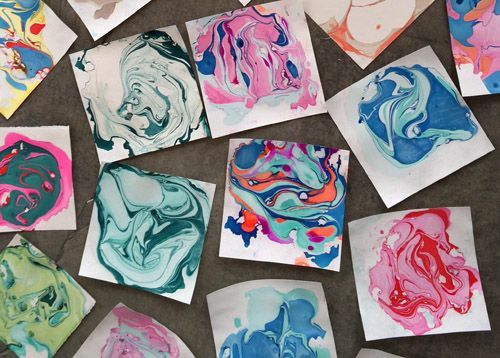 Come and have fun with paint and colour, make a mess and a fabuous canvas artwork to take home! 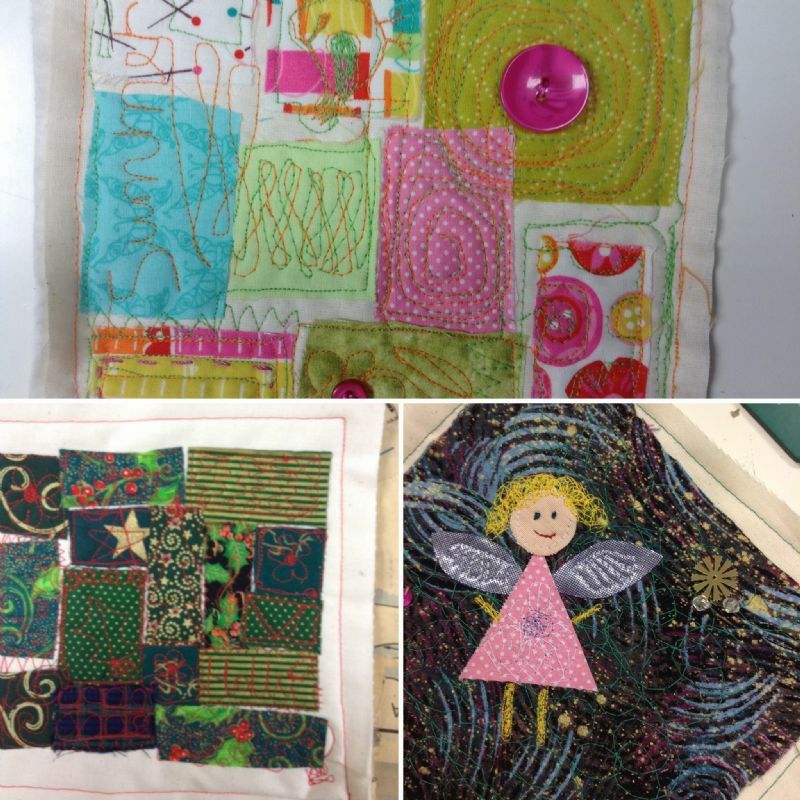 A lovely evening session where you will learn all about applique. No sewing experience is necessary. 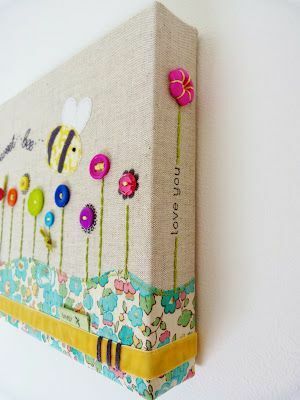 You will create your own simple design using pretty fabrics and stitching. All materials are provided. An introduction to crochet for complete beginners. 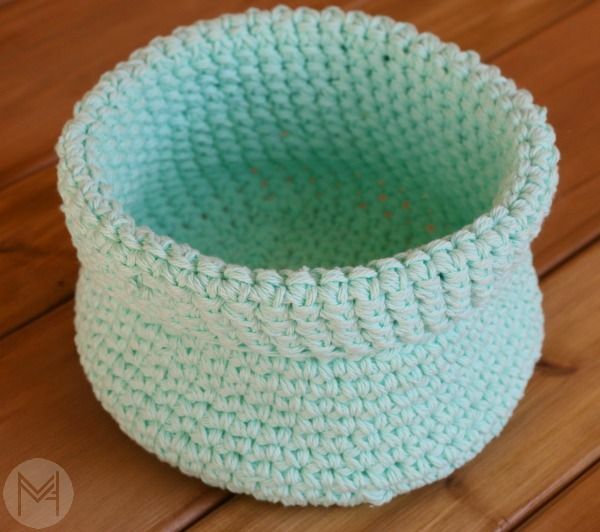 If you have ever thought about learning to crochet, then this is the workshop for you! 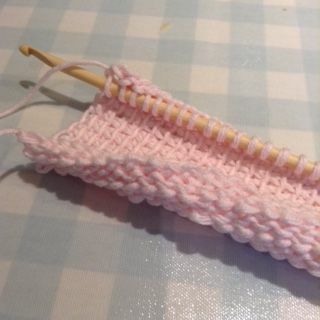 You will learn how to start crocheting and tackle a chain and double crochet stitch. You will then crochet a daisy using the stitches you have just learnt. If you find you enjoy crochet, our longer 3 week Crochet Course is perfect to develop your skills and for you to learn more stitches and how to read a crochet pattern. Come and spend a happy hour learning how to decoupage - it's the ultimate upcycling craft! 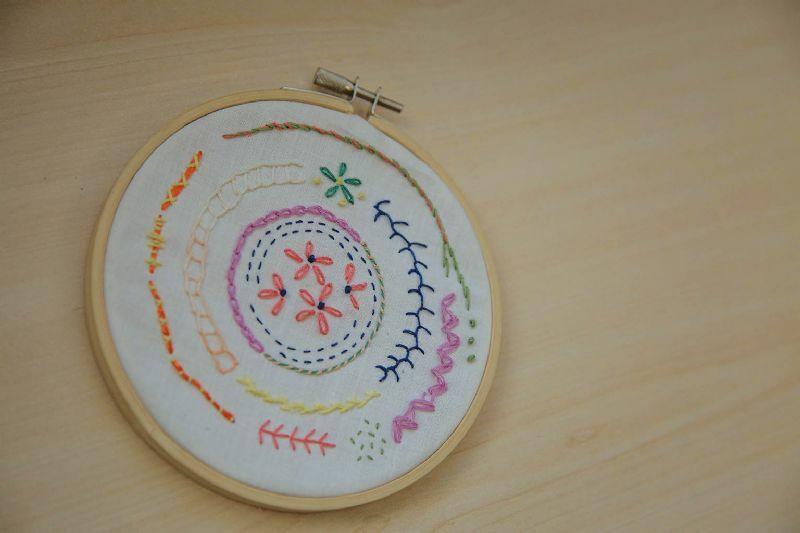 A workshop designed to give you an introduction to the world of hand embroidery. Katharine will show you some different styles of embroidery and stitches and you will choose a simple design to begin stitching yourself. 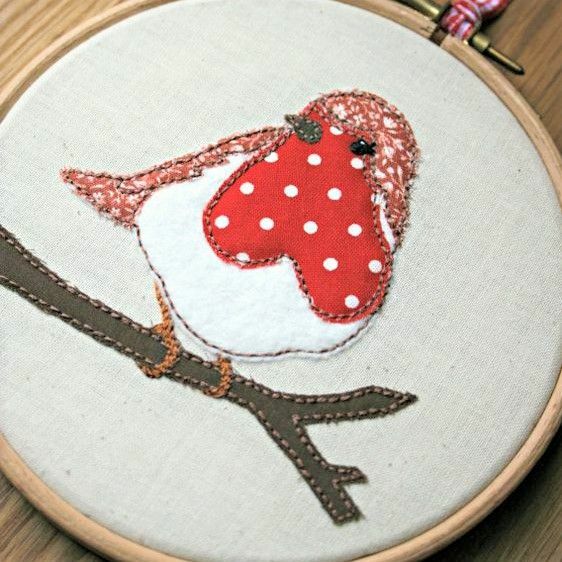 Embroidery is a gentle and relaxing craft, perfect for taking time out from our busy schedules. A starter session showing you how to begin working with dressmaking patterns: measuring correctly for your body size (the sizings on dressmaking patterns differ from brand to brand, and don't seem to match any high street sizing), choosing the right fabric for the pattern, and laying and cutting correctly. A great intro recommended for anyone who is new, or returning to dressmaking after some time. 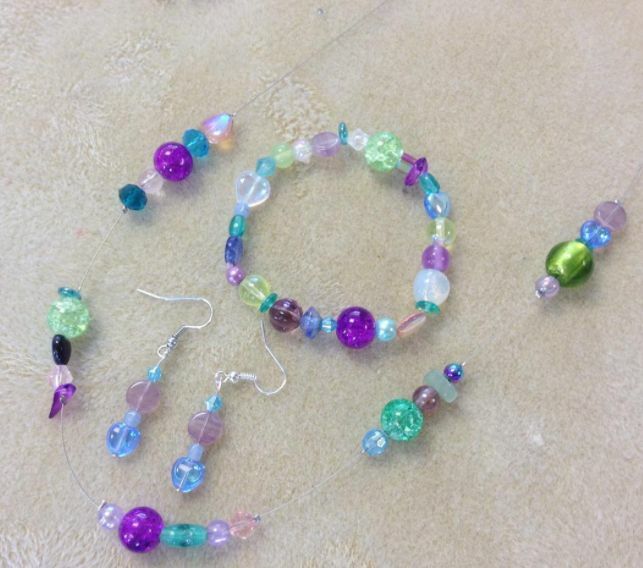 In this workshop, you will have to opportunity to make some simple pieces of jewellery, such as beaded bracelets and necklaces. 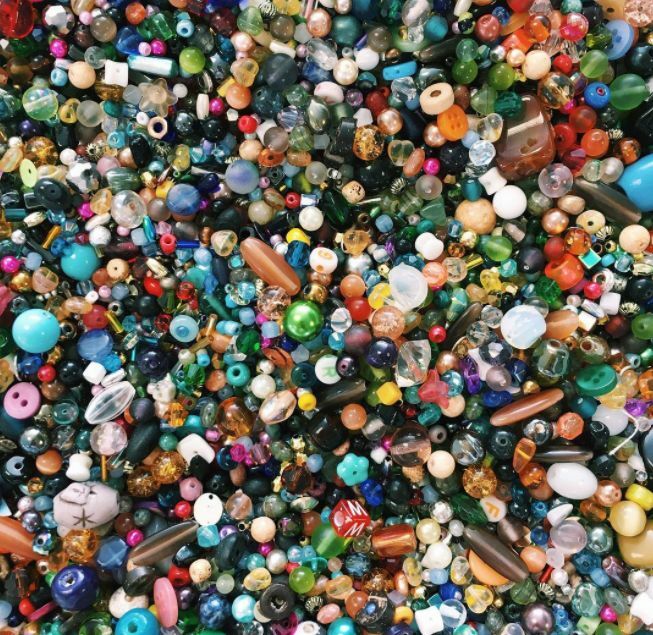 You can spend a happy hour looking through our extensive collection of beads, to choose a selection of your favourites to turn in to a wearable piece of artwork! 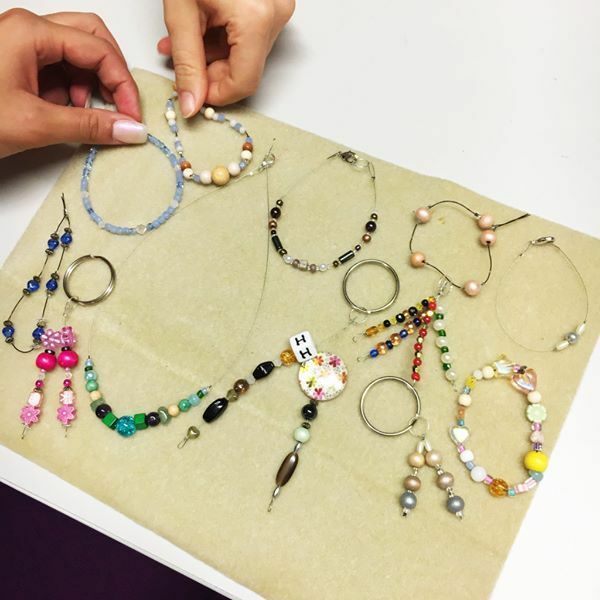 If you have attended some of our jewellery workshops before, you are welcome to come along and tackle more complex projects. 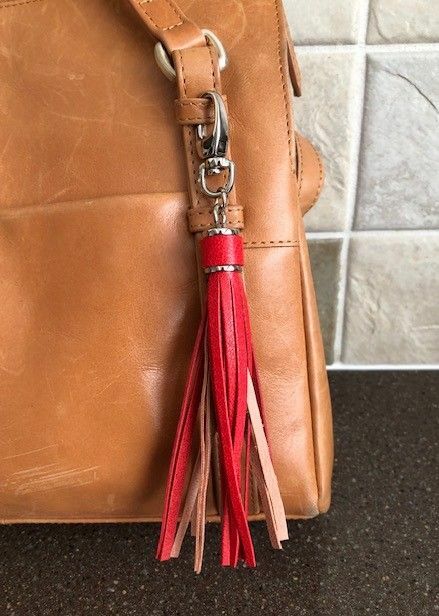 Start working with leather, learning how to cut, stitch and attach hardware to make your own stylish keyrings and bag charms. You will get to make 2 pieces during the class. On this taster workshop we will introduce you to the wonderful world of macrame! High on the trend list for homes at the moment, macrame is enjoying a return to fashion. 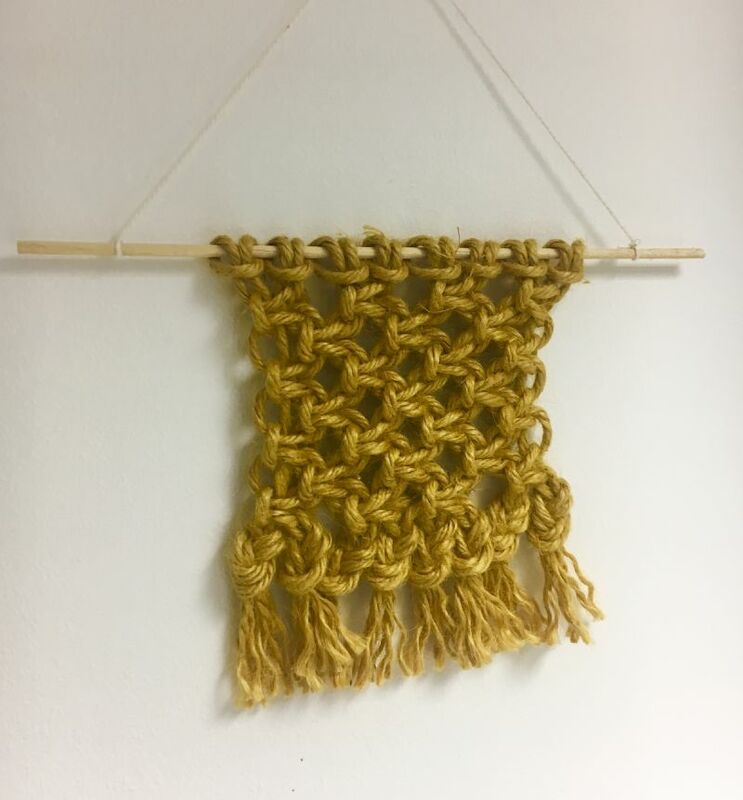 In this workshop, you will learn the basic knots used in macrame and have the opportunity to practise making them, before using them to make a small wall hanging. A lovely introduction to needlefelting. You will get to create your own mini landscape picture. We'll provide lots of inspiration and all the materials, but if you have a picture of your own you wish to bring to reproduce, then feel free to do so. 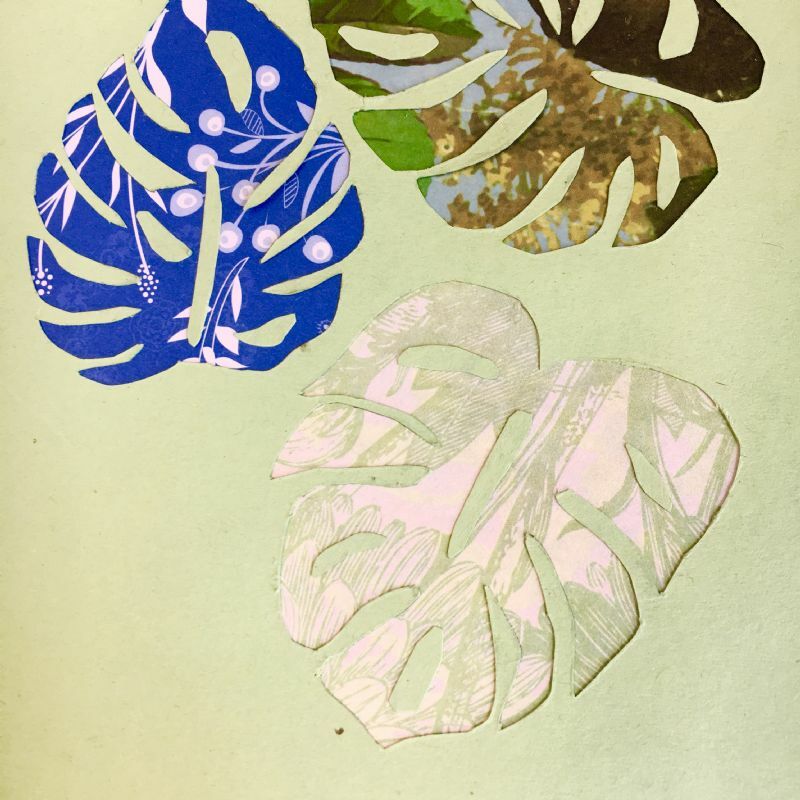 In this taster session you will learn the basics of paper cutting yusing - a great skill to add to cardmaking, or making delicate collages for your home. See how man pieces you can make during the session! Make yourself a fabulous mixed media canvas artwork in just a morning! There will be lots of ideas and materials for you to play and get creative with. 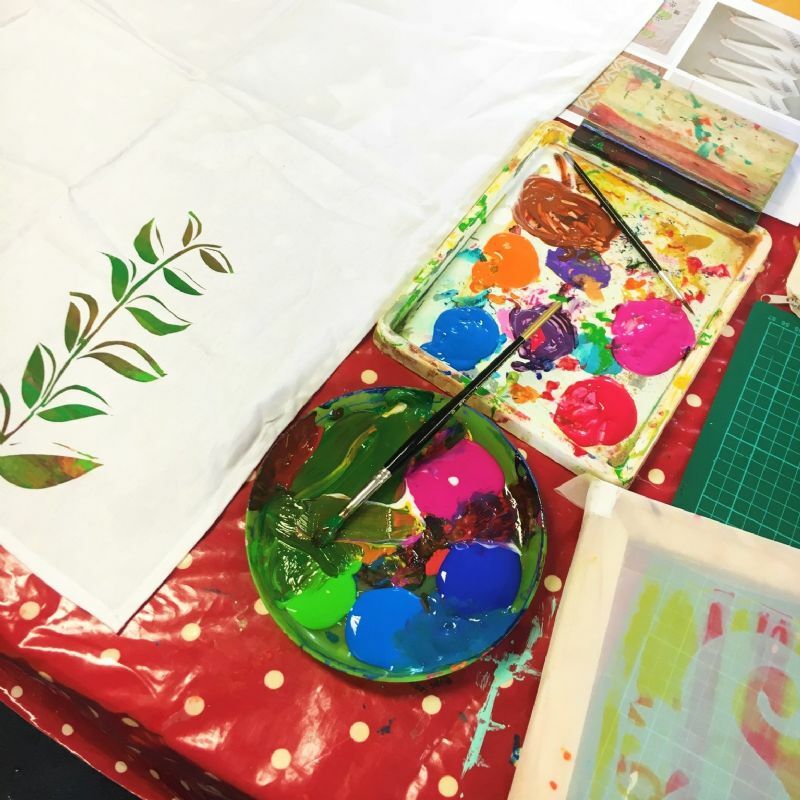 Come and try DIY screen printing and design and print yourself a washable canvas tote bag to take away! We'll show you a great, affordable way to make screens and templates which you'll be able to replicate at home. Come and spend a peaceful hour and half learning how to do Tunisian Crochet! It makes a beautiful soft, dense fabric perfect for resuable face cloths. 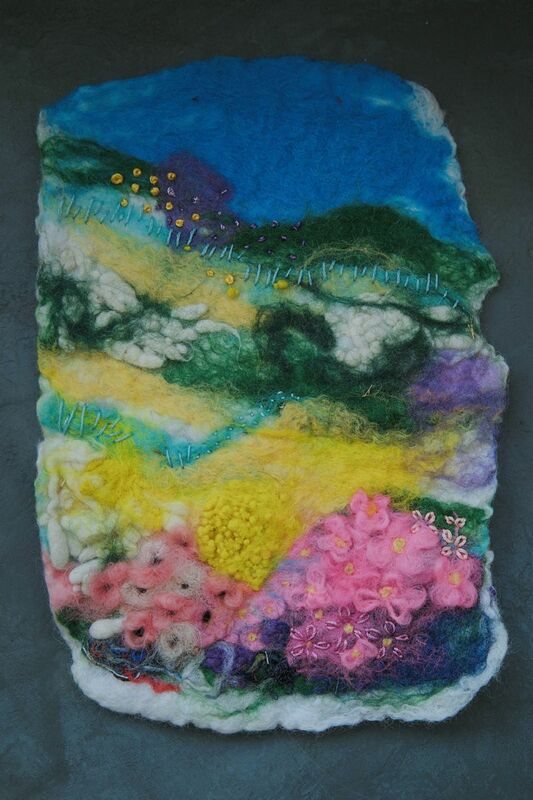 Come and have a go at Wet Felting. 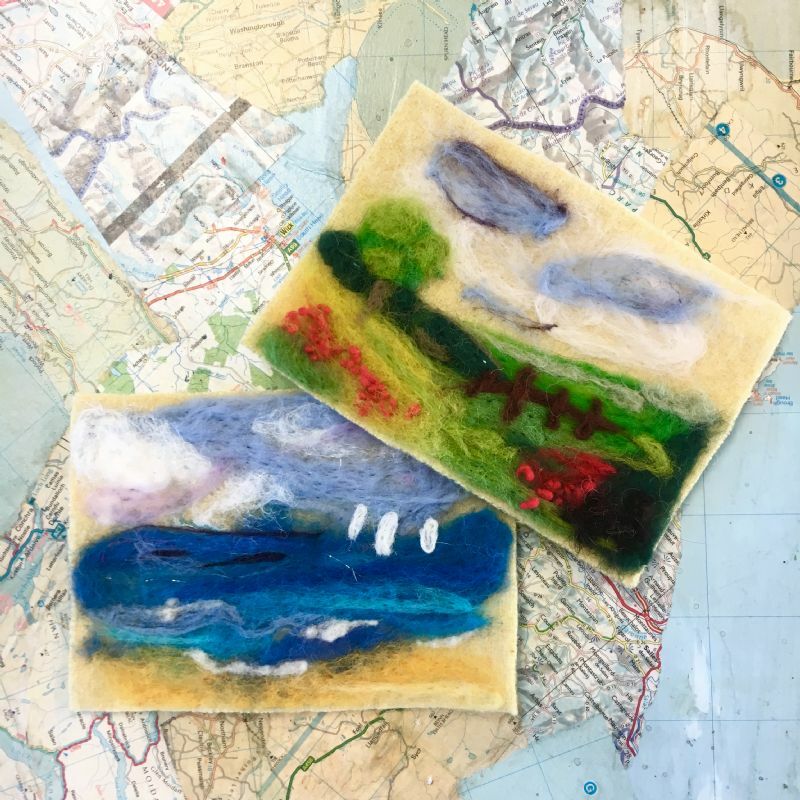 Learn the basic technique using wool tops, soap and water and have a go at making a mini picture in felt to take home. Why not add our Starter Wet Felting kit to your basket? Click here to find it in the shop. Come and learn how to make your own scented candles for gifts. 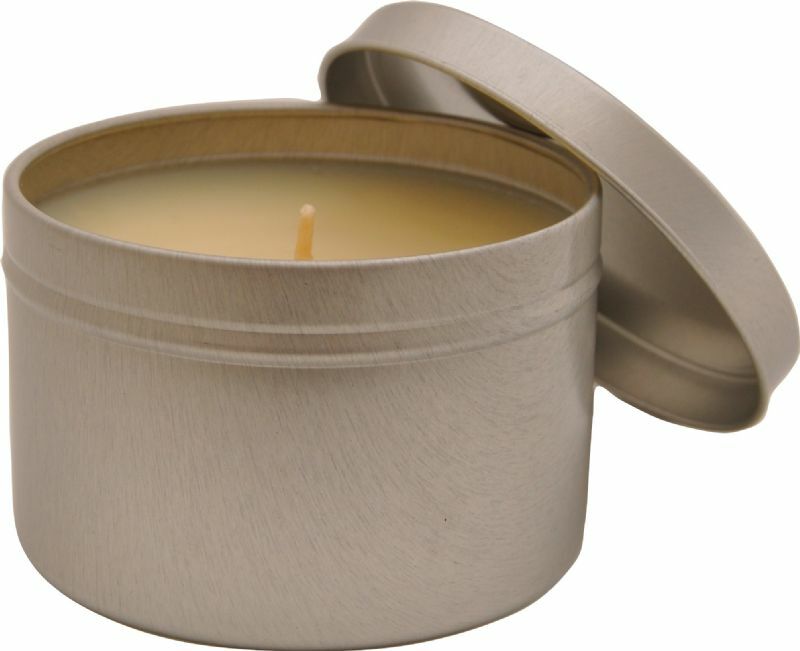 You will learn about different waxes and scents and make a glass candle and travel tin candle to take home.